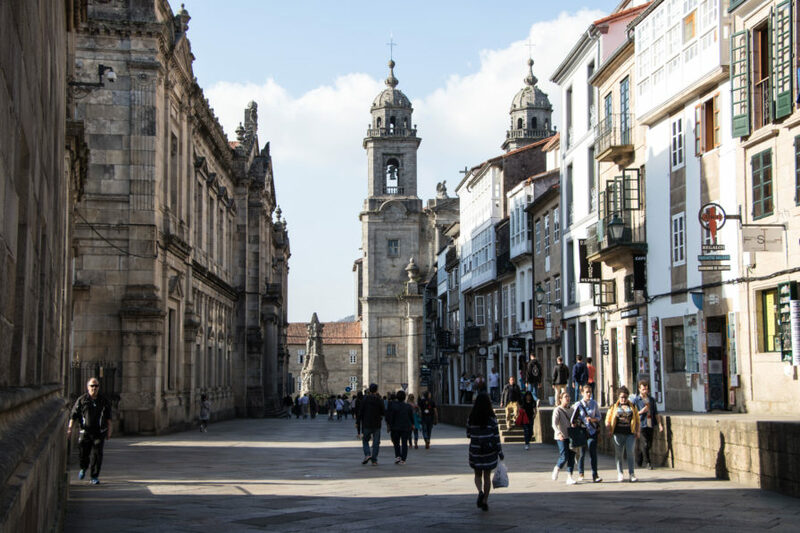 Make your way to the world-famous cathedral in Santiago de Compostela in northwestern Spain on this cycling pilgrimage of a lifetime – “The Way of St. James” bike tour with Top Bike Tours Portugal. The Camino de Santiago is known in English as the Way of Saint James and is a network of hiking and biking paths leading to the shrine of the apostle Saint James the Great in the cathedral of Santiago de Compostela in northwestern Spain, where tradition has it that the remains of the saint are buried. 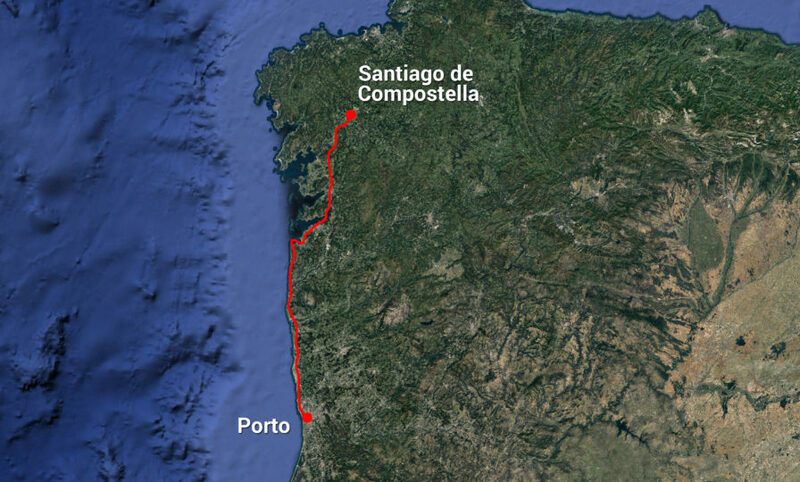 People from all around the world travel to Portugal and Spain in order to hike or bike one or more of the various routes to Santiago de Compostela as a form of religious pilgrimage or spiritual retreat. Others, however, chose to travel the Way of St. James purely for entertainment, sightseeing and enjoyment purposes. 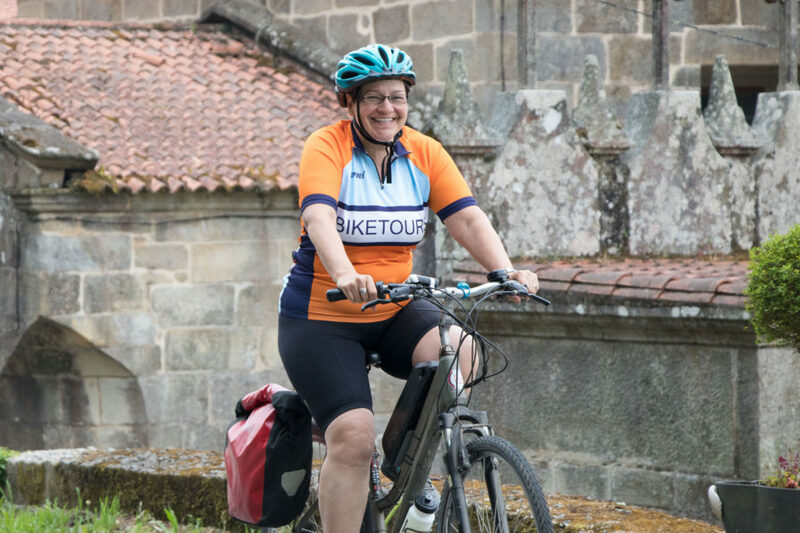 While it’s possible to cycle the Way of St. James on your own, many pilgrims opt to participate in guided or self-guided cycling tours, as this mode of travel offers one of the easiest and most enjoyable methods for successfully reaching the cathedral in Santiago de Compostela. 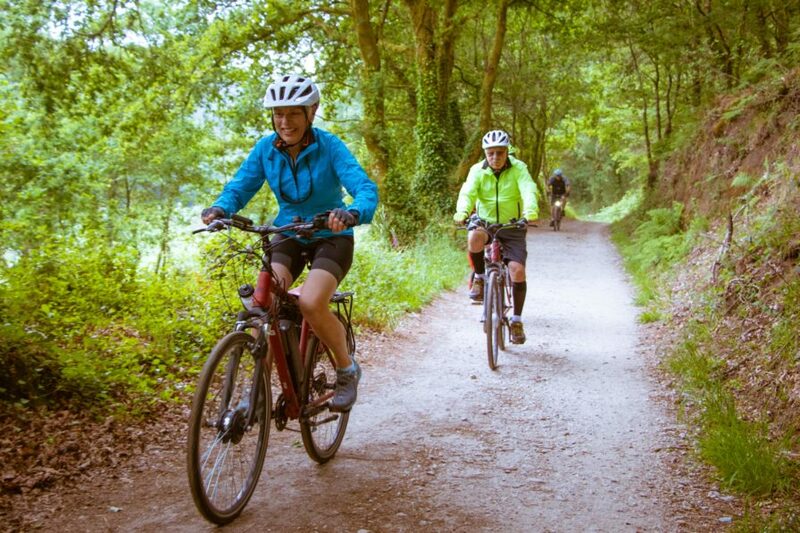 For those wishing to cycle the Camino, one of the best ways to do it is to start in the city of Porto, Portugal and then cycle from there, to the north, along the coast, approximately 278 kilometers (173 miles) to the city of Santiago de Compostela in northwestern Spain. 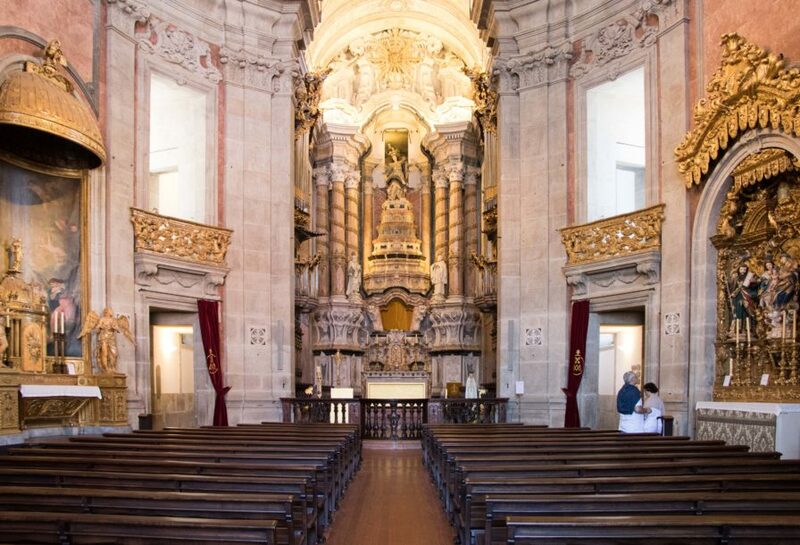 Then, after reaching the cathedral in Santiago de Compostela and completing the pilgrimage, simply travel back to Porto, Portugal and return home from there. This epic European adventure can be completed in a single week… and one of the best ways to participate this memorable cycling holiday is to take part in a guided or self-guided cycling tour with Top Bike Tours Portugal (previously known as “Fold N’ Visit Cycling Holidays“) – a small tour company based out of Porto, Portugal that specializes in this leading customers from all around the world along this particular route in northern Portugal and Spain. The map above shows the approximate route you will travel over the course of “The Way of St. James Bike Tour” with Top Bike Tours Portugal – starting in Porto, Portugal and ending in Santiago de Compostela, Spain. 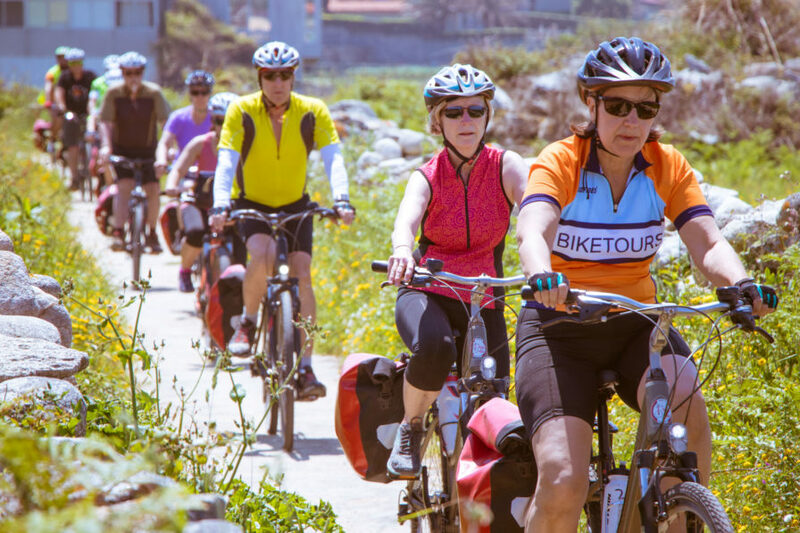 In May of 2018, I had the pleasure of participating in “The Way of St. James Bike Tour” with Top Bike Tours Portugal. 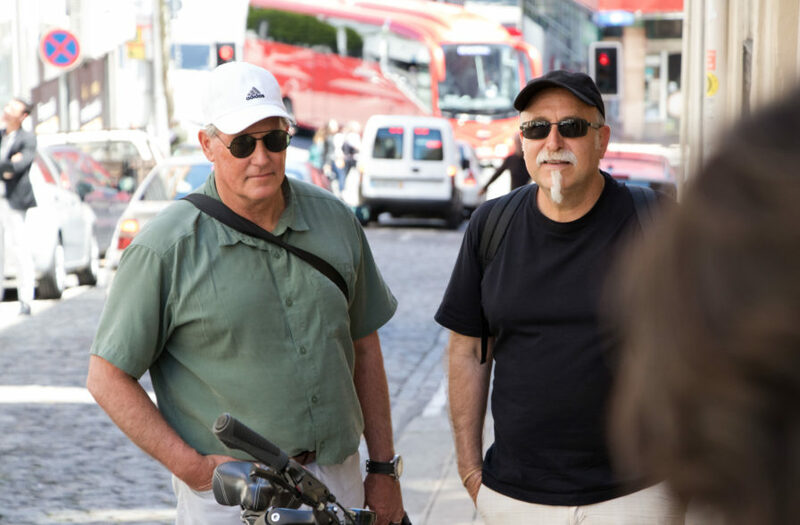 I flew into Porto, Portugal from the United States and was picked up at the airport by Sergio – the owner of Top Bike Tours Portugal. The Porto airport is located approximately 15 kilometers from the city center, so it was nice to step off the airplane and instantly be greeted by someone from the tour company who was able to help me load my bags into the van and drive me to the center of beautiful Porto, Portugal – a stress free start to the tour! 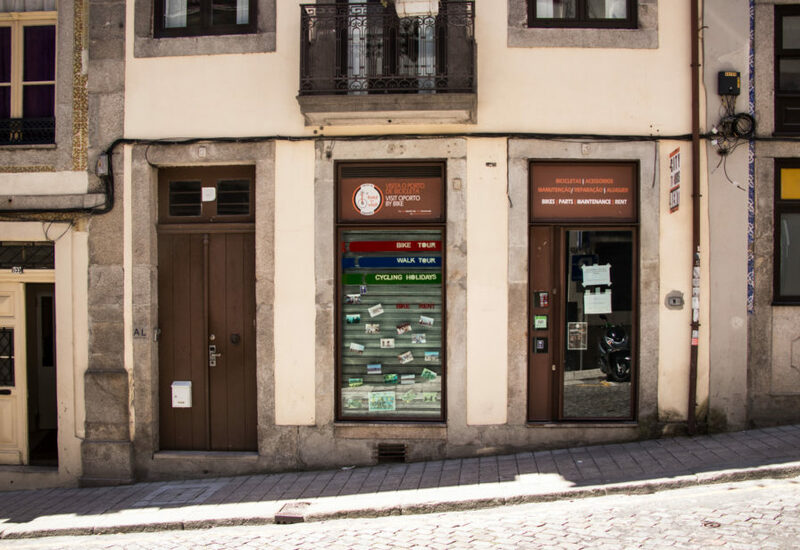 Top Bike Tours Portugal operates out of a very small and almost completely non-nondescript building on a narrow street near the Trindade metro station in the north-central part of Porto. Inside this small commercial space, dozens and dozens of bicycles are packed in and lined up next to one another… and in the back of the building is a small office that doubles as a repair bench and workstation for the company’s many bicycles. 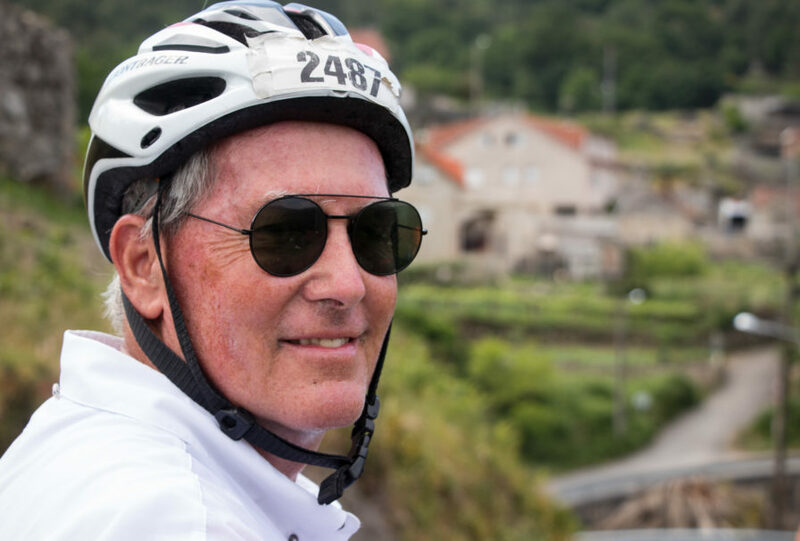 After arriving at the Top Bike Tours Portugal headquarters, I was instantly fitted with a bicycle that I would ride for the duration of the bike tour. 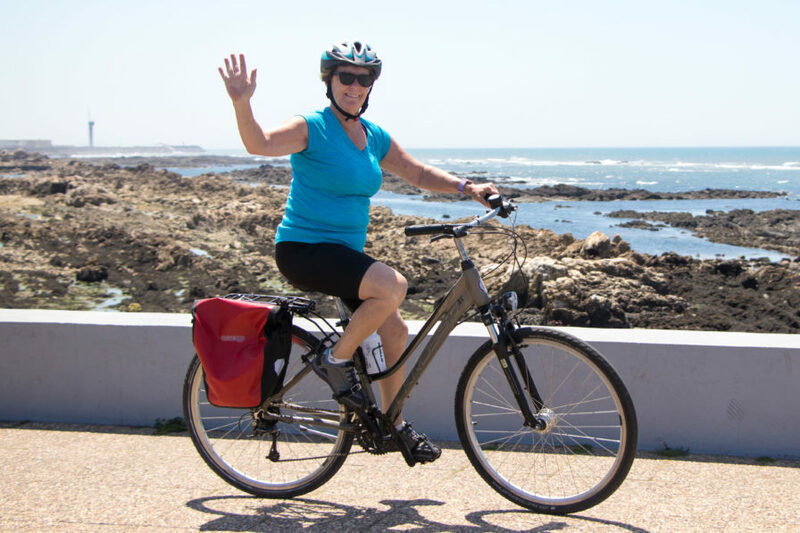 This is one of the many nice things about participating in “The Way of St. James Bike Tour” (or any bike tour, really) with Top Bike Tours Portugal – there’s no need to fly your own bicycle all the way to Portugal. Flying with a bicycle is a huge pain… and can be quite costly! 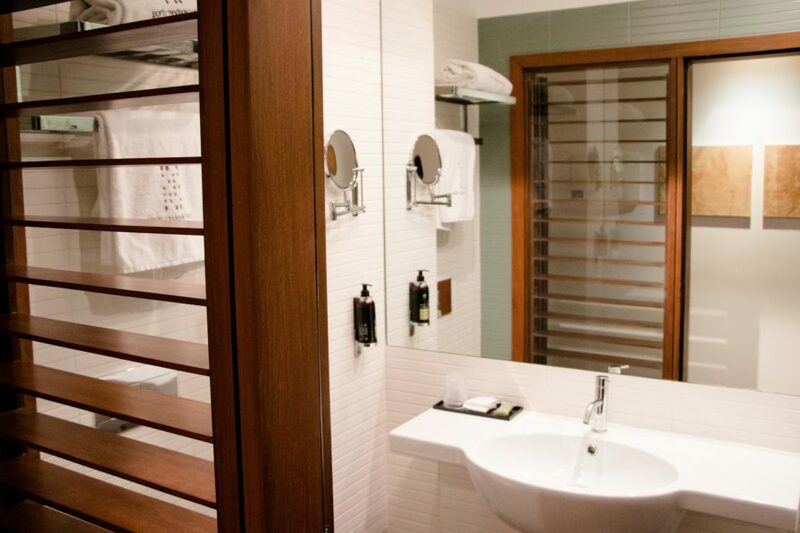 Instead, simply travel to Porto on your own with a few changes of clothes and your toiletries, and the rest will be taken care of for you! There will be a bicycle waiting for you when you arrive, and all the rest of the tour details (such as nightly accommodations, the route you’ll cycle, etc) will have been arranged for you in advance. All you have to do is get on the bike you’re provided with, follow the recommended route, and check into your per-arranged hotels each night. After I was fitted with a bicycle, I was shown to my hotel for the evening, the Porto Trindade Hotel, which is located just a short 210 meters away from the Top Bike Tours Portugal office. This tall, modern, business hotel is located opposite the Trindade metro station, and is the perfect starting place for a trip to Porto, Portugal. 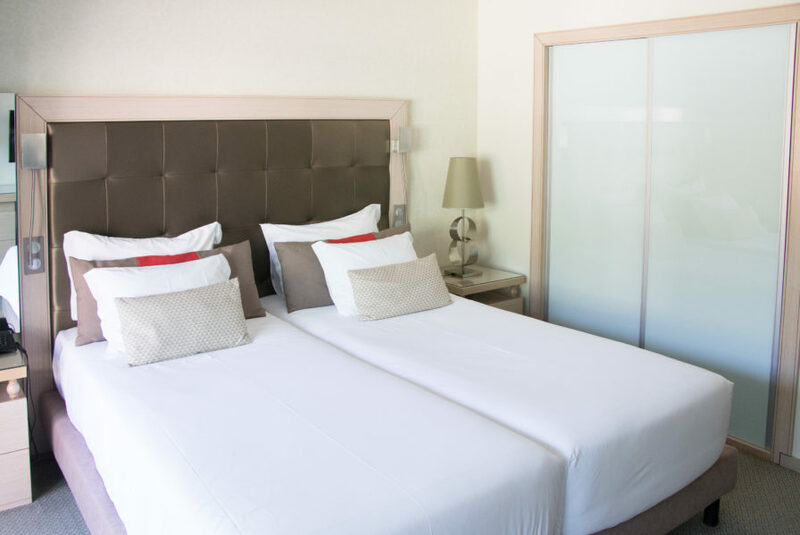 The rooms are spacious and clean – contemporary, yet stylistically European. After a short time in my hotel room, I returned to the Top Bike Tours Portugal headquarters, where I met up with several other people who had flown in to participate in “The Way of St. James Bike Tour.” Mike (shown below on the left) had joined the tour after his wife read about it on the Internet and signed him up for the trip as a gift… and Jim (shown below on the right) had signed up for the bike tour after he read on my website that I was participating in the tour myself. Then we met up with Alan and Rosemary, who had flown in from Arizona. Alan was another one of my www.bicycletouringpro.com readers who had joined the bike tour after I announced my intention to participate. After our small group had gathered at the Top Bike Tours Portugal office, we were introduced to Jose – one of the four tour leaders who would be guiding us each day on “The Way of St. James Bike Tour.” Jose introduced himself and then took us on a two-hour-long walking tour of Porto, Portugal – showing us the churches, the train stations, the architecture and the history of this beautiful European city. One of the many things Jose pointed out to us were the mostly blue tiles that we saw scattered throughout the city. These tiles, while not always blue, were on the outside of buildings, houses and commercial enterprises. 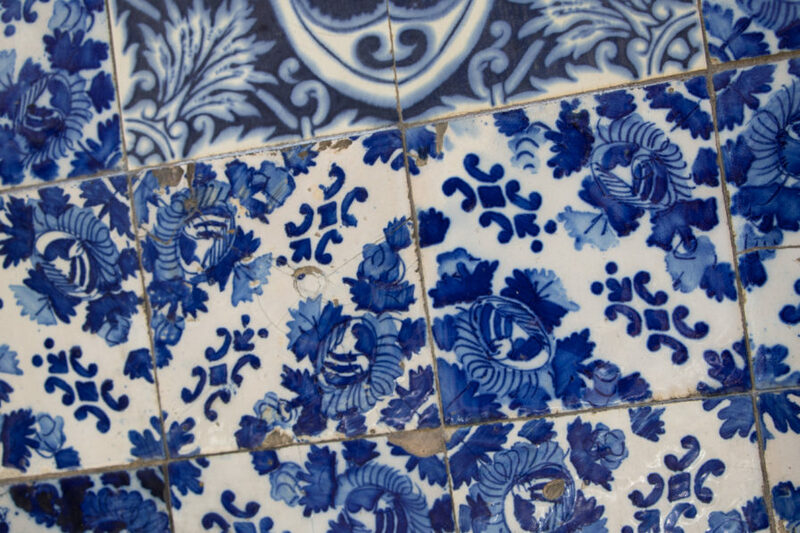 These blue tiles are called azulejos, and while they’re not always blue, they usually are of the blue (or azul) persuasion… and they can be found on walls, floors and ceilings all across Portugal. 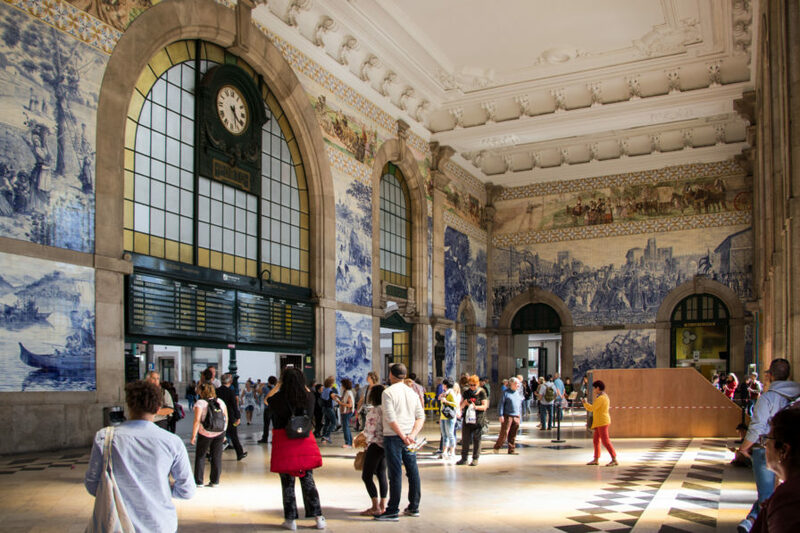 Jose took us to the São Bento Railway Station in the center of Porto, where some of the best azulejos in all of Portugal can be seen in the atrium leading into the station. In this room there are approximately 20,000 azulejo tiles, dating from 1905–1916, that were composed by Jorge Colaço, an important painter of azulejos at the time. 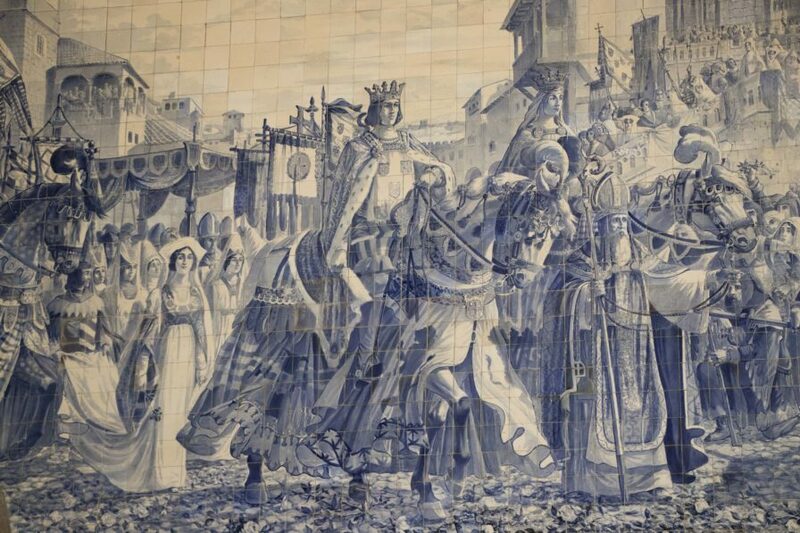 The upper parts of the railway station frieze are lined with azulejos depicting a chronology of the various forms of transport used by man in Portugal. On the south wall of the atrium (pictured below) is a painting of the entrance to Porto of King John I and Philippa of Lancaster, on horseback, to celebrate their wedding. From the São Bento Railway Station we continued our tour through the city and eventually made our way to the waterfront – one of the most picturesque parts of Porto. 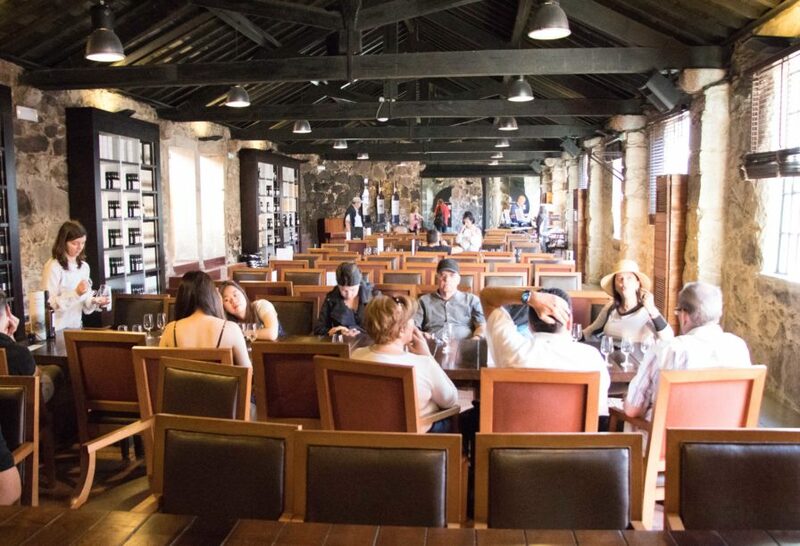 Once there, we walked across the Luís I Bridge and entered the Burmester Wine Cellars, where we were given a short tour of the winery and learned why Port wines (and other wines made in the Douro region of Portugal) are so special. Eventually, we were taken to a large tasting hall where we were given the opportunity to taste several of the wines we had just learned about. 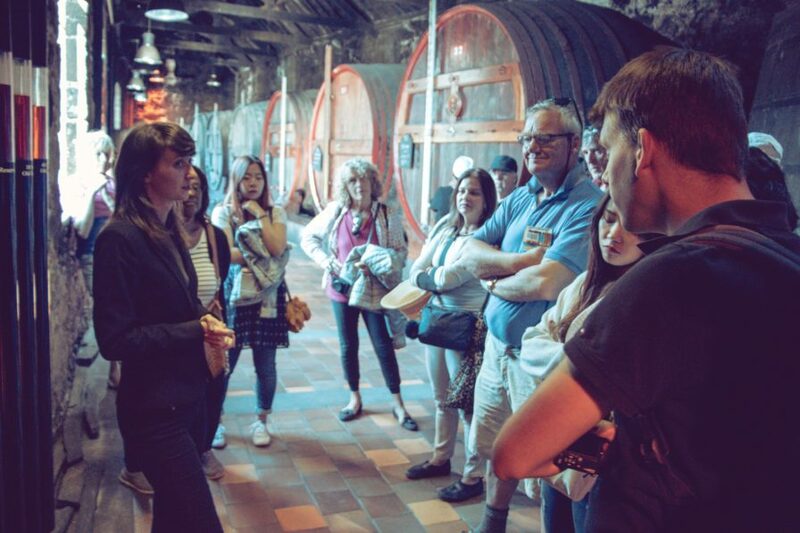 Some individuals on the tour even bought a bottle of wine or two to take home with them as a souvenir of their trip to Porto. After our walking tour of Porto was complete, our small group of travelers returned to the Porto Trindade Hotel and promptly fell asleep. It had been a long day. We were tied… and we knew that we had a big day ahead of us. The following morning we’d begin the cycling portion of our pilgrimage to Santiago de Compostela! In the morning, we woke up early and had breakfast in the hotel. There was a big buffet breakfast on offer and we scarfed down the delicious presentation as quickly as we could before returning to our rooms, grabbing our things, and walking them down to the hotel lobby, where they were then loaded into the Top Bike Tours Portugal van, which would follow us along our route; carry our belongings (so we didn’t have to carry them on our bicycles); and provide us with food, water and medical assistance along the route, if necessary. 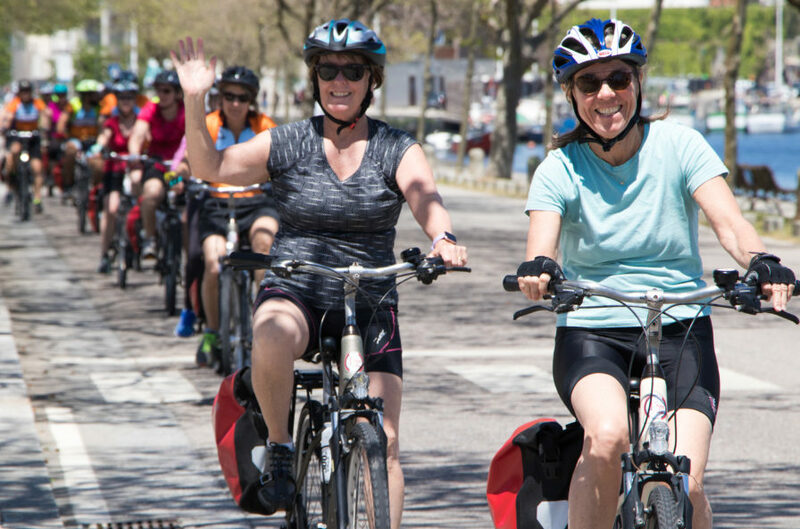 While “The Way of St. James Bike Tour” can be completed as either a guided or self-guided bicycle touring experience, the tour that I chose to participate in was a large, guided group bicycle tour with approximately 25 total tour participants from all around the world. 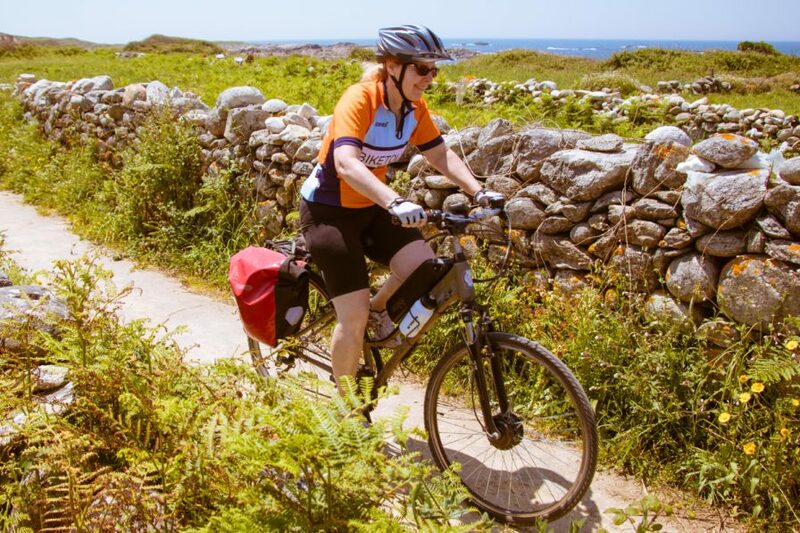 This made the experience of cycling from Porto, Portugal to Santiago de Compostela, Spain even more exciting, because there were so many different people to share the experience with. But it also made it a challenge for the four tour guides who were leading us along the route, as they needed to get our large group out of the city safely. I was worried about the traffic leading out of Porto and with such a big group, I didn’t know how the Top Bike Tours Portugal tour leaders (Sergio, Jose, Tiago and Pedro) would get us all out of the city without any of us getting lost or separated from the group. But to my amazement, the bike ride out of Porto was a whole lot easier than I had originally thought. We wound our way through the cobblestone streets, down to the river’s edge, and then eventually found our way onto a separated bike path along the western side of the city. Once on the beach, the stress of city cycling escaped me and I could relax. We had made it to the scenic side of Portugal and the bike ride from here on out was exactly what I expected of Portugal when I signed up for this particular bike tour. 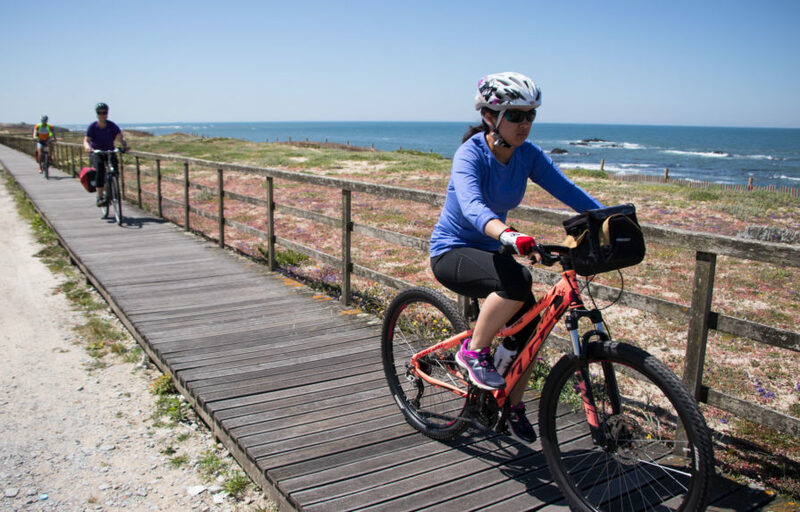 While there was a nice bike path along the beach during our exit from the city of Porto, that bike path eventually disappeared and we found ourselves cycling on a mix of paved roads, dirt paths and wooden boardwalks. The boardwalk sections were my favorite part of the ride. 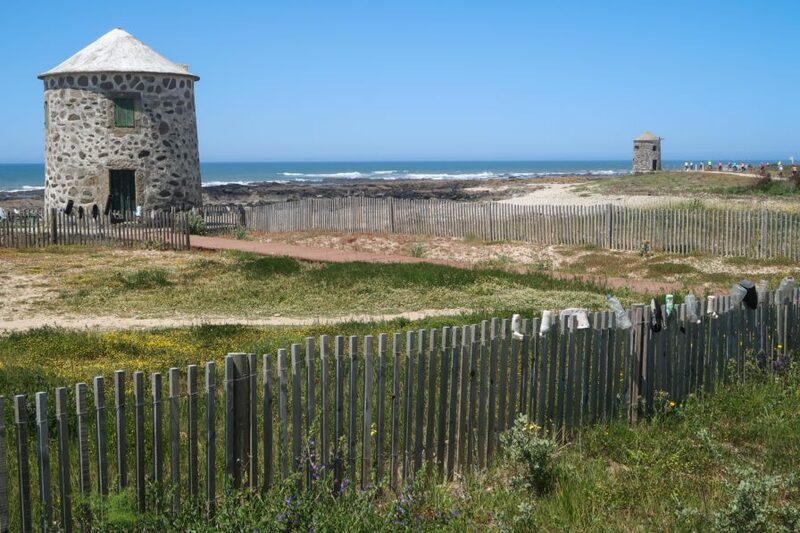 From the boardwalks, we could see the Atlantic Ocean to our left – with seagulls flying in the air and a slight breeze blowing through the sand dunes at our side. Some time after noon, we stopped at a small, local restaurant and ordered lunch. Breakfast is included in the price of “The Way of St. James Bike Tour,” but lunches and dinners are not. This is a good thing though because it makes the overall cost of the bike tour much lower… and it allows you to order the food that you want – rather than being served a big group meal that you may not particularly enjoy. So, this was our first experience with eating out in Portugal, tasting the local cuisine and figuring out how to pay for our individuals meals after we had eaten. After a well-deserved meal, we jumped back on our bicycles and began the second half of the cycling portion of the day. This part of the ride took us down the seaside, through the city of Vila de Conde, and then inland for a little bit through a small section covered in trees. It was very hot and sunny on this first day of the bike tour, so the shade from the trees felt nice. Note the van in the photo below following behind our group of bike tour participants. That is the Top Bike Tours Portugal van that followed us throughout the tour. All of our personal belongings were being carried in that van… and the van would stop on occasion to refill our water bottles, pick up sick or tired cyclists, and hand out fruit and granola bars to hungry tour participants. After what felt like a very long day in the saddle, we eventually made our way to the sleepy city of Esposende and checked into the Hotel Suave Mar – a large, rectangular hotel with white walls, a red roof and a swimming pool located in the center of the building. Just across the street from a bike path and the ocean, the Hotel Suave Mar was the perfect place to spend the evening after a long first-day of cycling. 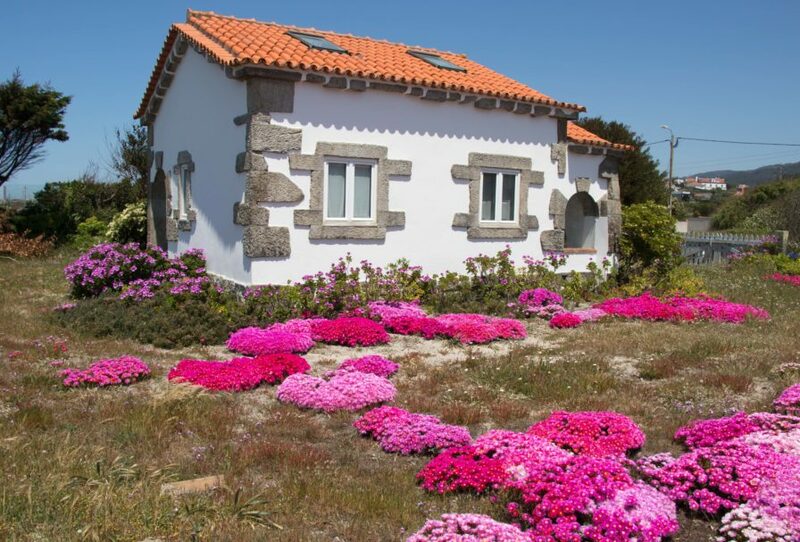 When I originally signed up for “The Way of St. James Bike Tour,” there was very little information on the Top Bike Tours Portugal website about the accommodations. And because the price of the tour was so low, I kind of assumed that the hotels we’d be staying at were going to be far from first-class. But arriving at Hotel Suave Mar after this first day of cycling made me quickly change my mind. The Porto Trindade Hotel in Porto had been quite nice… and Hotel Suave Mar was even nicer. I couldn’t quite believe it! After checking into our individual rooms and taking a well-deserved shower, we had a little bit of time to kill before dinner. Some people went swimming; others went for a walk along the beach; and I opted, as others did as well, to take a short nap. Then, in the evening, we all went out to dinner. 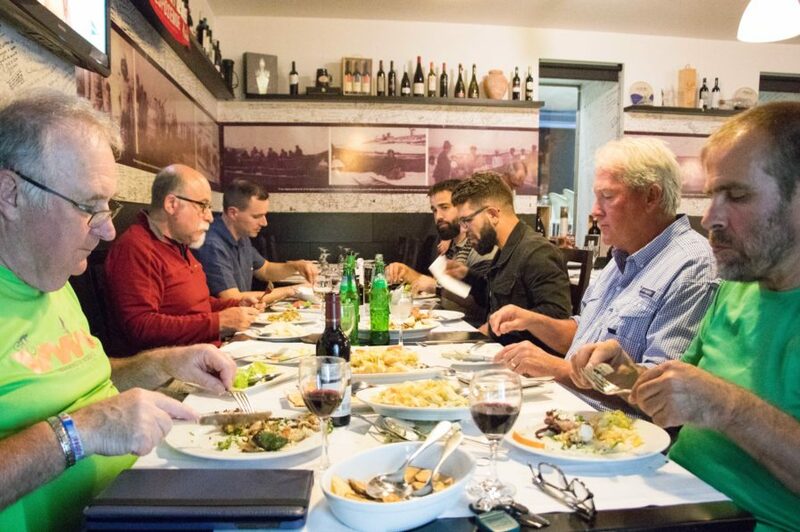 The tour leaders (Sergio, Jose, Tiago and Pedro) took us out to a nearby restaurant called O Buraco, where we got our first real taste of Portuguese seafood. As a vegetarian, I had a hard time finding something substantial for me to eat, but others in our group ate well. 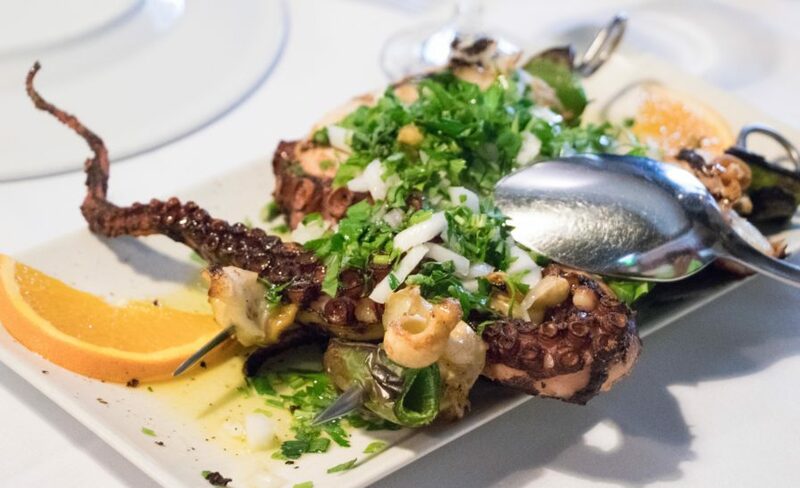 Gordon, for example, ordered this exquisite octopus dish, which he said tasted absolutely delightful. While others in the group dined on shrimp, meat, potatoes and wine. It really was an amazing feast! After a good night’s rest at Hotel Suave Mar, we woke up early and ate breakfast in the hotel dining room. Bread, fruit, yogurt, eggs, meat and more were on offer for our morning meal. Then, as we had done the day before, we carried our belongings down to the waiting tour van, hopped onto our bicycles and took off down the bike path that was located just across the road from the front steps of the hotel. The first few kilometers of our ride on the second day of “The Way of St. James Bike Tour” led us down a dirt farm road. This was a whole lot of fun! Then, we turned inland and began cycling on a mix of paved roads and cobblestone streets. 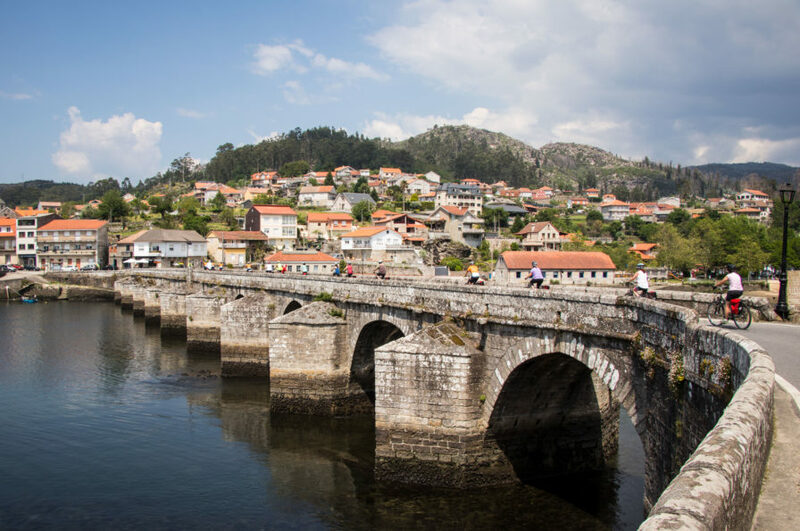 Eventually, we cycled across the Limia River and into the city of Viana do Castelo, where we stopped for a short lunch break. 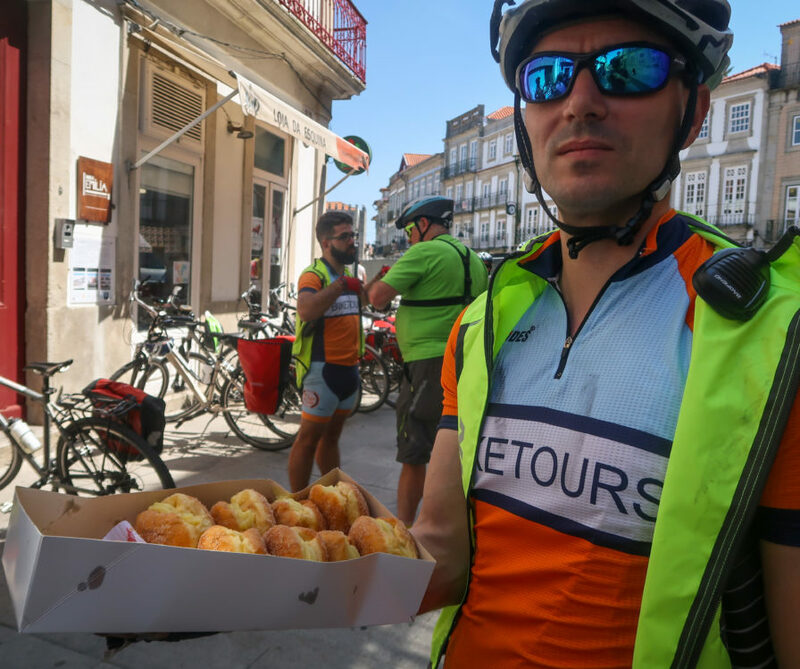 Upon our arrival, the Top Bike Tours Portugal tour leaders greeted us with a free sampling of a local delicacy – a donut like desert filled with lemon cream. Yum yum! This is one of the many benefits of participating in a guided bike tour. If you were to cycle this route on your own, you probably wouldn’t know that this particular local food is so good and you’d ride your bike right past the shop selling these delicious pastries without ever knowing that you just ridden past one of the most memorable foods you may have ever eaten. Because the meals are not included in the price of “The Way of St. James Bike Tour,” our large group of 25 split up into several smaller groups and we were free to walk around the city for an hour or so and find any place that suited our fancy for lunch. I eventually found a small shop selling vegetable soup and I ordered two bowls of the delicious broth for my meal that day. After eating, we jumped back on our bicycles and began cycling north up the coastline once again. This was probably one of the most scenic sections of the entire week-long bike tour. One moment we were cycling along the Atlantic ocean, looking out at the water splashing up against the rocks along the shore… and the next moment we were biking through colorful flowers growing outside small beach bungalows. The terrain was almost entirely flat, which made for some really enjoyable sections of beach-side cycling. There were a few dirt roads and cobblestones to ride over, but nothing we couldn’t handle. Most of the people participating in “The Way of St. James Bike Tour” were 50 years old or older. And while most of these people had a fair amount of cycling experience, very few of the tour participants had ever ridden a bicycle this far in such a short amount of time. Luckily, the daily distances on “The Way of St. James Bike Tour” are not too overwhelming. The first day on the road was the longest at 60 total kilometers (37 miles). Day two was a bit shorter at only 50 kilometers (31 miles). And the following days were all within that comparable range: 40 km on day three, 57 km on day four, 26 km on day five and 40 km on the final day of the tour. 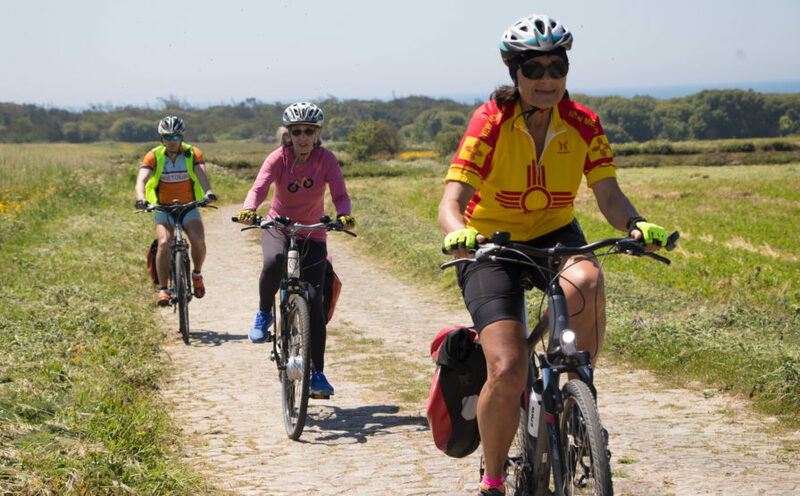 While the roads are flat and the distances are relatively short, the most challenging aspect of “The Way of St. James Bike Tour” is getting used to all the cobblestones in the road. You can see in many of the photographs on this page just how bumpy the roads can be. This is especially true during the second and third days of the bicycle tour. As you get closer to Santiago de Compostela, the roads begin to improve and the bumps all but disappear. The cobblestones do take a little getting use to, but the scenery makes it easy to forget about the bumps in the road. Around nearly every bend is another stunning ocean scene. The third day of the bike tour and the second day of cycling ends with a memorable bike ride along a small coastal trail that we then shortcut through the wooded Mata do Camarido forest, along the Rio Minho and to the front front steps of the Hotel Porta do Sol Conference and Spa on the outskirts of Caminha, Portugal. 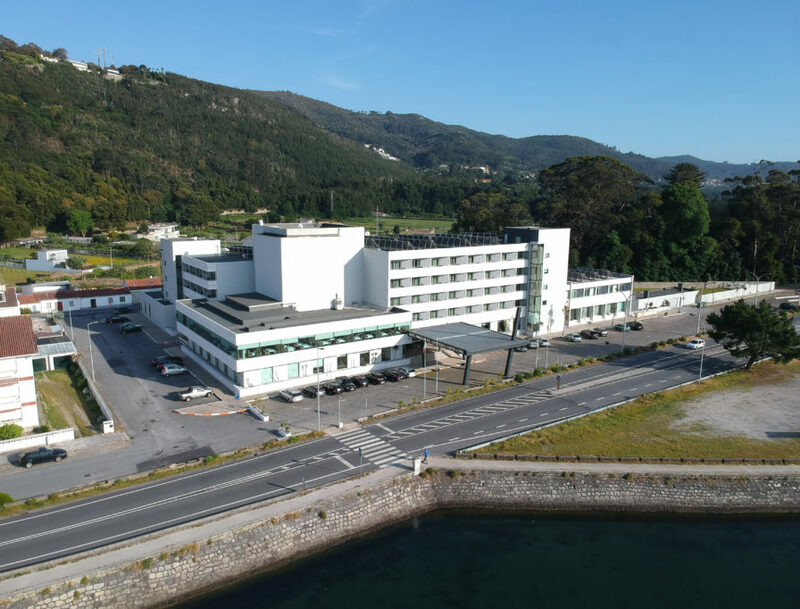 Hotel Porta do Sol is located right across the road from the Rio Minho, which is the river that separates Portugal from Spain and flows into the Atlantic Ocean just a few hundred meters away from the hotel. 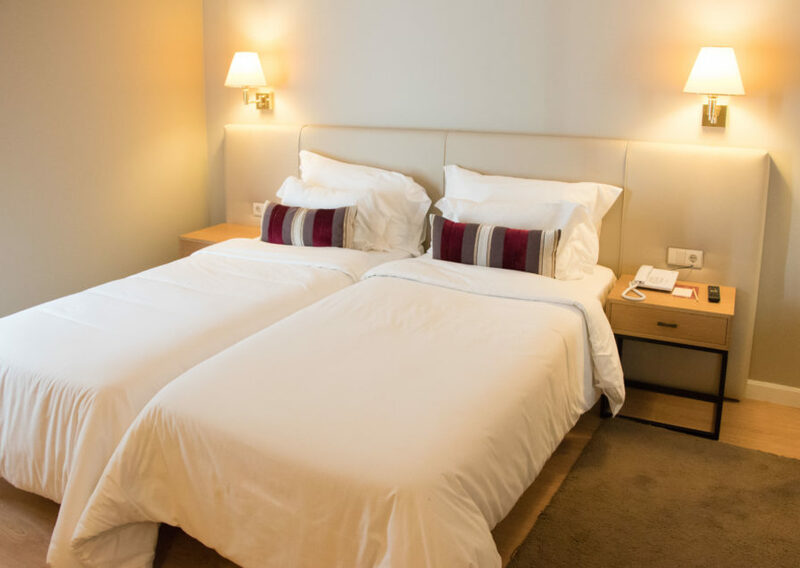 This large, white, concrete hotel features spacious rooms that face either toward the river and sea on the front side of the hotel, or toward the mountains and the swimming pool on the backside. The swimming pool at the Hotel Porta do Sol is a great place to be during the afternoon heat. Grab a cold drink and enjoy a splash in the water before returning to your hotel room for a shower, an afternoon nap, or a short walk along the riverfront. 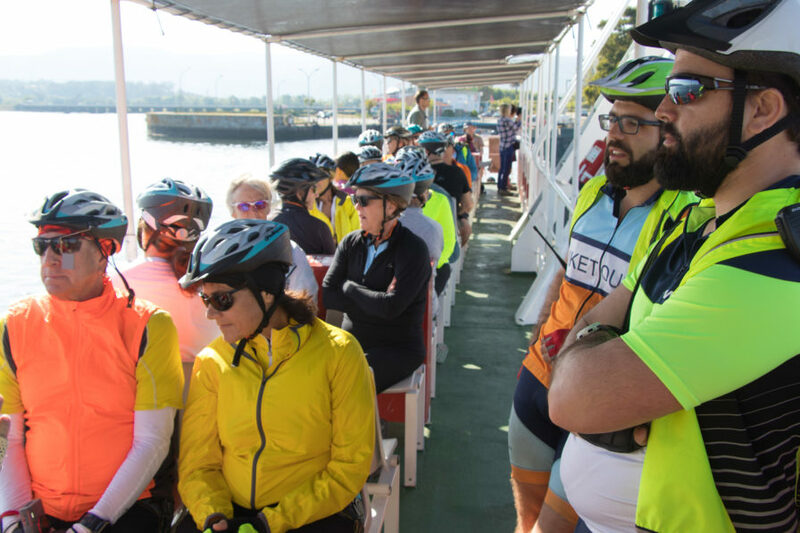 In the evening, a small group of us from “The Way of St. James Bike Tour” gathered in the hotel lobby and then walked the short distance from the hotel to the center of Caminha. This small, quiet town has a bustling city center filled with dozens of delightful restaurants, cafes and souvenir shops. We opted to eat at a charming little place called Baptista, which was located across the street from the city’s main square. 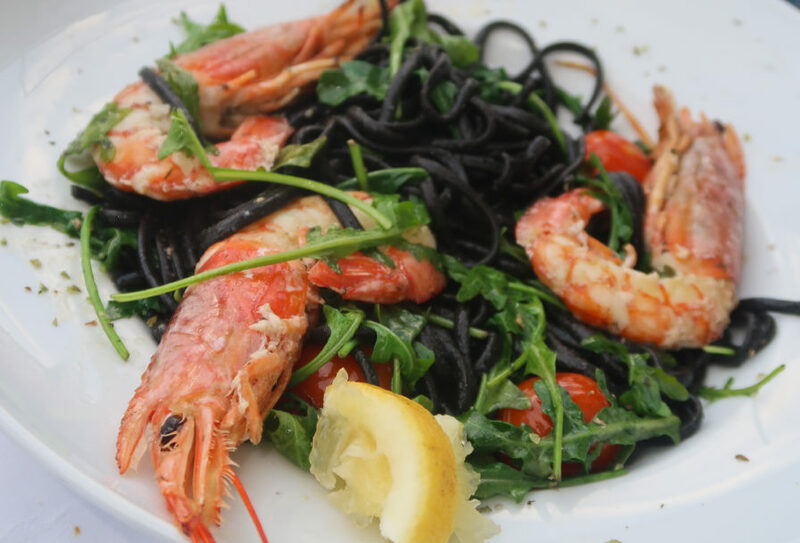 Once again, we were offered a plethora of sea food options (as is common in much of Portugal), but being the vegetarian in the group, I was delighted to dine on a delicious vegetarian pasta, which turned out to be one of my favorite meals on the entire bike tour. Our small dinner group walked back to the Hotel Porta do Sol in the dark and, while I can’t speak for the others in the group, I know that I fell asleep just about as soon as my head hit my pillow. The following morning, we woke up early, ate a delicious buffet breakfast in the hotel dining room, and then dashed outside to load our things into the waiting tour van, jump on our bicycles and cycle down the road to the nearby ferry terminal. We needed to reach the ferry terminal on time, because if we missed the morning ferry, we’d be stuck in Portugal until late in the afternoon. Thankfully, no one was late and the Top Bike Tours Portugal tour leaders were successful in leading their 25 tour participants across the water and into nearby Spain! When we got off the ferry boat, we cycled down the beach and into Spain! It was only the third day of cycling on our pilgrimage to Santiago de Compostela, yet we could feel the shrine of the apostle Saint James the Great drawing closer. Rather than bike straight onto a busy road filled with cars and traffic, we skirted around the most south-western part of Spain on a series of wooden boardwalks and walking/biking trails. This was one of my favorite segment on the entire bike tour! Just a short distance down the road was the small city of A Guara, Spain, which is situated on the hillside above a small protected bay. We stopped here for a moment to go to the bathroom and fill up our water bottles. Then we continued cycling for several kilometers north and up the coastline. Around every single bend there was another splendorous scene to take in. I stopped multiple times to take photos and shoot video on my phone. Around lunchtime, we reached the tiny town of Oia, where we parked our bicycles outside the Mosteiro de Santa María de Oia and then walked into town for another delicious lunch. Most of our group at at the Taperia A Camboa, which is a delightful outdoor restaurant consisting of small tables covered in white umbrellas with views of the Atlantic Ocean from almost every single chair. As we ate, a skinny cat rubbed up against our legs under the table, quietly begging for a taste of our meals. There were so many beautiful areas that we cycled through over the course of this week-long bike tour in northern Portugal and Spain. My favorite areas, however, were the parts of the ride where the road narrowed and we found ourselves cycling on a smooth section of road surrounded by rocks and flowers with the seaside just within view. 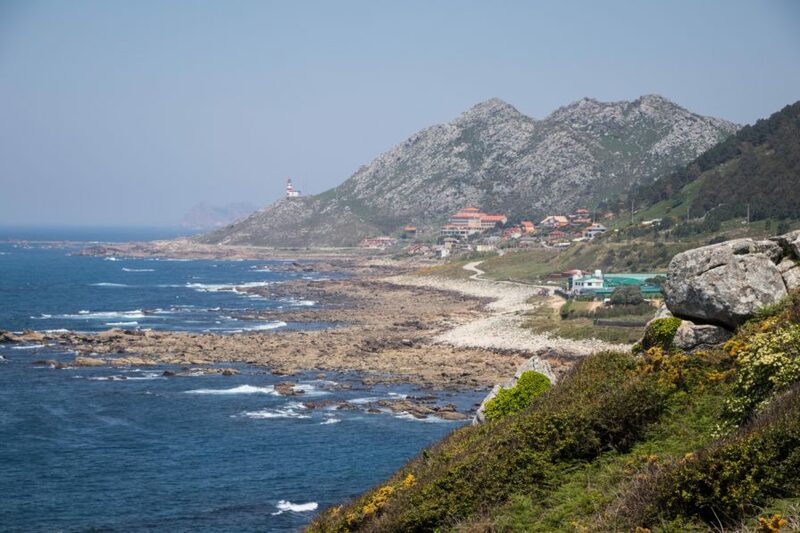 On this particular day, we spent several hours cycling along the coast, with the road following a mostly flat trajectory between the mountains on our right and the ocean on our our left. 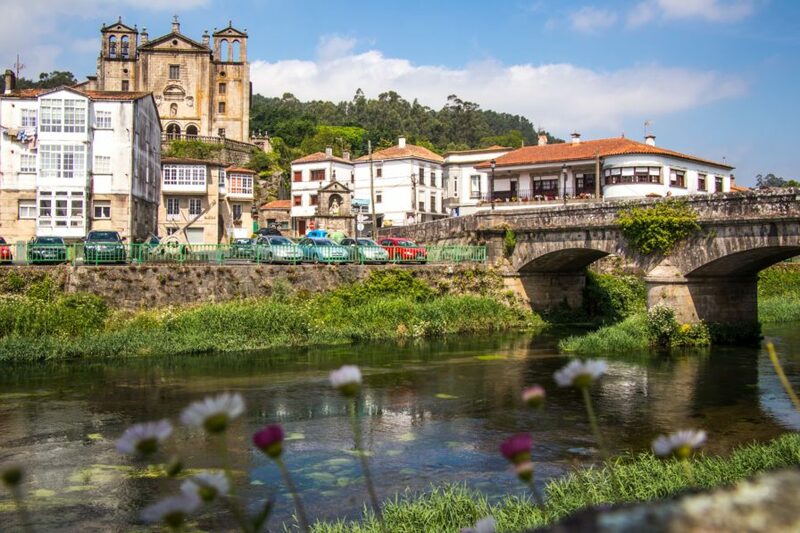 Around every bend in the road was another spectacular scene filled with blue water, ocean views, small towns or villages, and friendly people either walking or cycling the Camino trails leading to Santiago de Compostela. This third day of cycling was probably the most enjoyable day of cycling on the entire “Way of St. James Bike Tour:… and to be honest, the day ended far too early. I was enjoying the ride… and I was enjoying the views. 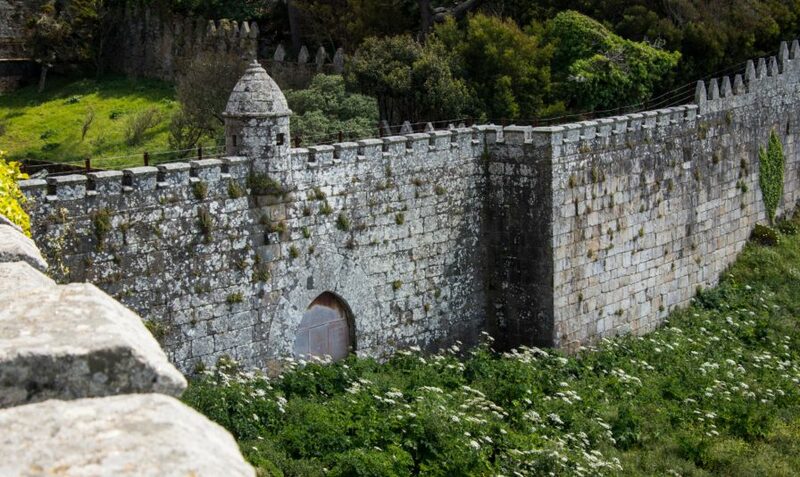 But when we pulled into the city of Baiona, Spain and I saw the large stone walls surrounding the Castelo de Monterreal, which would be our home for the night, I knew we were in for something special. I couldn’t believe that this magical place is where we’d be spending the evening! After checking into the hotel, the first thing I did was put on my walking shoes and take a 30-minute walk around the walls of the fortress. Along the way, I stopped and snapped dozens of photos – as every few meters there was another spectacular scene before me. On one side of the castle walls, the Illas Estelas (a small chain of islands) could be seen floating in the water in the distance. 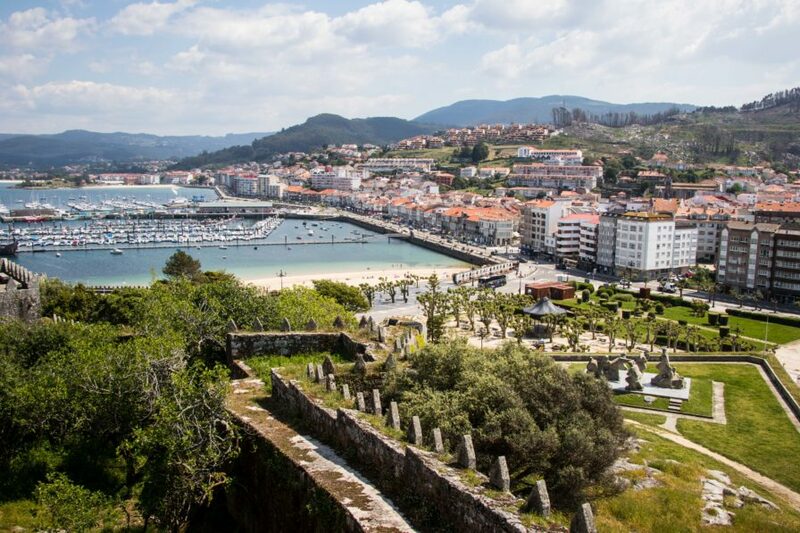 On the other side of the castle was the Puerta de Felipe IV and the city of Baiona, with its port filled with sailboats from all around the world. The inside of the Castelo de Monterreal was nearly as nice as the views on the outside. It really did feel as though we were staying in a castle… and we had practically the entire place to ourselves! We walked into the city center in the evening and ate dinner at a local restaurant before returning to the castle after dark, where we then promptly went to bed, feel asleep and woke up the following day, only to repeat this process all over again. 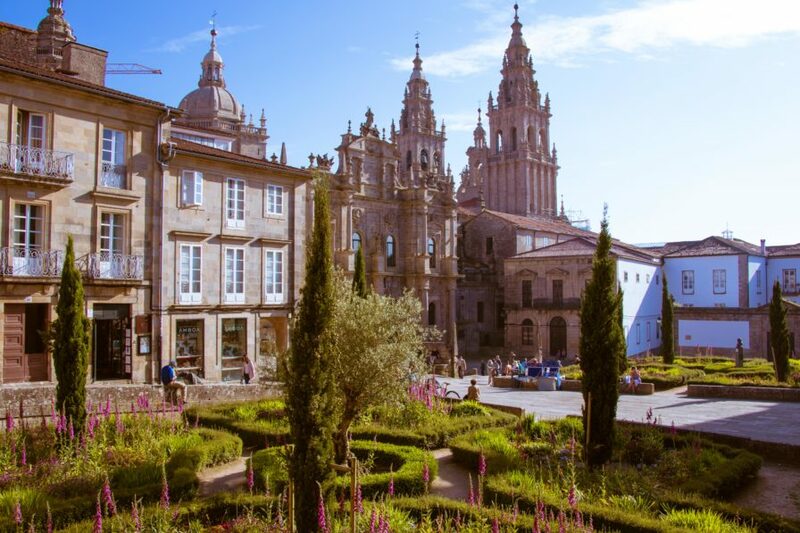 We packed up our bags, ate a breakfast buffet in the hotel dining room, and then jumped back on our bicycles and began cycling north again toward the city of Santiago de Compostela. I was sad to leave the Castelo de Monterreal, because it was such a beautiful place with truly magical views, but Sergio and the other tour leaders promised me that there were even more amazing places to be experienced in the coming days. So, with some hesitation, I continued cycling north toward our ultimate pilgrimage point. We were told in advance that this particular day of cycling would start out nice, but would become more difficult during the middle of the day as we neared the city of Vigo, Spain. There was some beautiful beachfront cycling at the beginning of the day, with views of the Castelo de Monterreal and the Illas Estelas off in the distance. But as we neared the city of Vigo, the traffic began to increase and we really had to concentrate on staying together as our large group slowly made our way through the crowded city. There was a fair amount of traffic during the bike ride through Vigo and there were no dedicated bike paths to speak of in much of the city. Thankfully, the traffic was moving slowly and the drivers were courteous, so we made it through the hustle and bustle without any problems. On the northeastern side of Vigo, we cycled up a long, gradual hill until we reached the top and then practically sprinted downhill to the tiny town of O Vao. It was here that we biked across a beautiful stone bridge and then took a short rest break on the northern side of the crossing. It is places like this that make “The Way of St. James Bike Tour” so memorable. This is the sort of scene I think about now when I think about bicycle touring along the coast of Portugal – water, boats, cobblestones, bridges, mountains and little holiday homes scattered about on the hillside with their red roofs and well-manicured gardens. After we made our way out of the city of Viga and crossed the cobblestone bridge in O Vao, we knew that the worst of our bike ride that day was behind us. But we had also been told that there was one short, but steep climb ahead of us that needed to be conquered before we would reach our accommodation for the evening. While most of “The Way of St. James” bike tour is extremely flat… and this is a bike tour that almost anyone with any bike riding experience can complete successfully… this final hill of the day was a challenge for some of the people in our group. Everyone ultimately made it to the top, but a few people did have to get off their bicycles and walk the final steep pitch to the summit of the climb. Those that had already reached the summit stood at the top of the hill and cheered their fellow bike tourists on, letting them know that they only had a short distance to go until they reached the top of the last little hill of the day. When the final few tour participants reached the top of the climb, everyone danced and cheered and shouted in celebration! 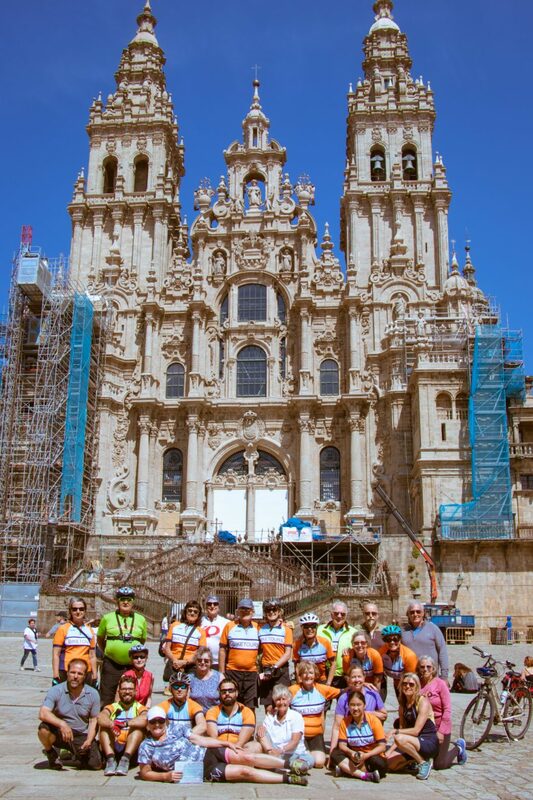 The most difficult day of “The Way of St. James Bike Tour” was now behind us… and there were only two more days of cycling to go until we reached the shrine of the apostle Saint James the Great in the cathedral of Santiago de Compostela. 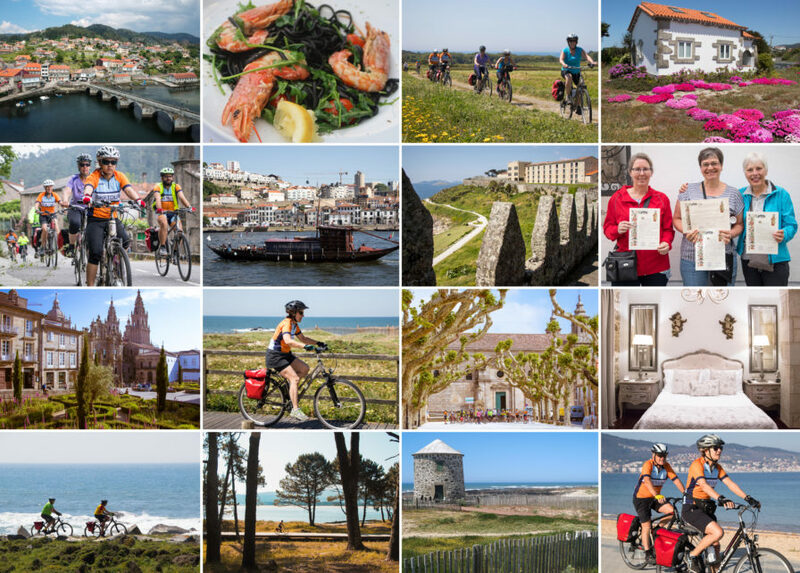 On the 4th night of our guided group bike tour in northwestern Portugal and Spain we stayed at the Parador de Pontevedra in the city of Pontevedra. 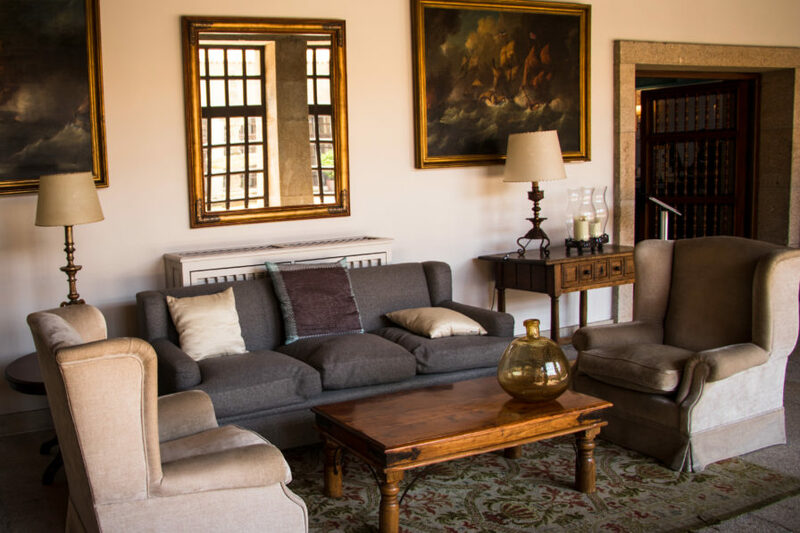 This beautiful stone hotel is located in the heart of Pontevedra – a stunning, maze-like city that is most famously known for its well-preserved old town and Gothic Santa María la Mayor Basilica. Once again, staying at the Parador de Pontevedra felt like stepping back in time and spending the night at a medieval castle. The accommodations looked somewhat archaic, yet were luxurious and with all the comforts of home. After checking into the hotel, taking a shower and walking around the city, we were free to dine wherever we wished in the city center. There were tons of different restaurants to chose from! On this particular evening, I ate with the tour leaders at a local pizza restaurant and watched with a smile on my face as children from the city raced around on pedal-powered cars (small bicycles with four wheels). The following morning we were allowed the luxury of sleeping in just a little bit longer than usual, because this particular day was the shortest day of the entire bike tour – about 26 total kilometers. So, after waking up and eating another spectacular buffet breakfast in the hotel dining room, we gathered outside the hotel, where we loaded our belongings into the support van, lifted our legs up and over the top tubes of our bicycles, and began making our way north on a series of marked Camino trails. 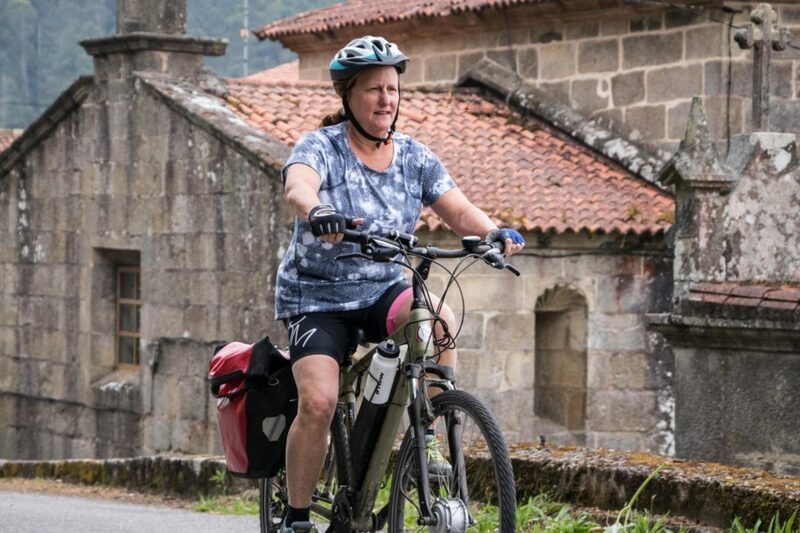 All throughout the bike tour (even on the first day of the trip as we were leaving Porto) we were seeing lots of hikers and bikers (or pilgrims, as they are called) making their way north toward Santiago de Compostela. 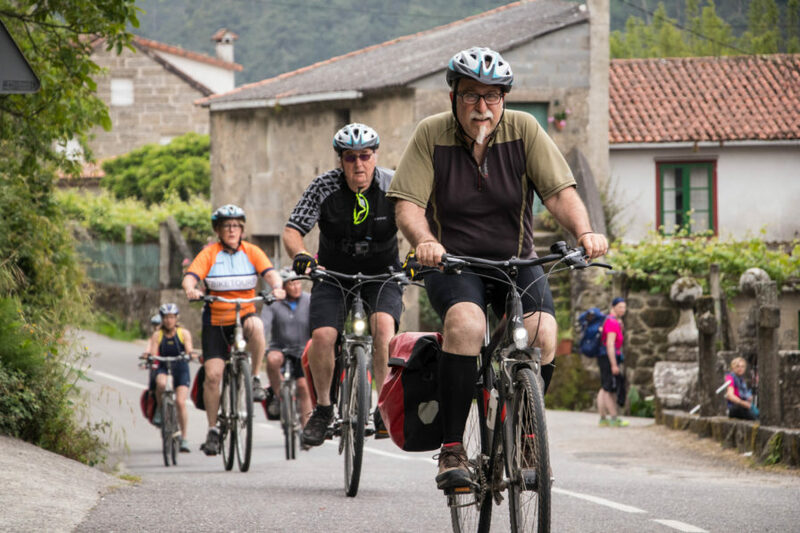 Most of these pilgrims chose to walk or hike the Camino, but many people opt for cycling as well. On this particular day, we really began to see the number of pilgrims on the trail increase. There were hikers and bikers everywhere! And many of these pilgrims wore seashells on their backpacks – a symbol to others they they were hiking the Camino. Approximately 17 kilometers (10+ miles) into our bike ride, we stopped at the Parque natural del Rio Barosa to see the Cascada del Dio Barosa – a magnificent waterfall nestled in a peaceful forest just a short distance off the N-550 highway. 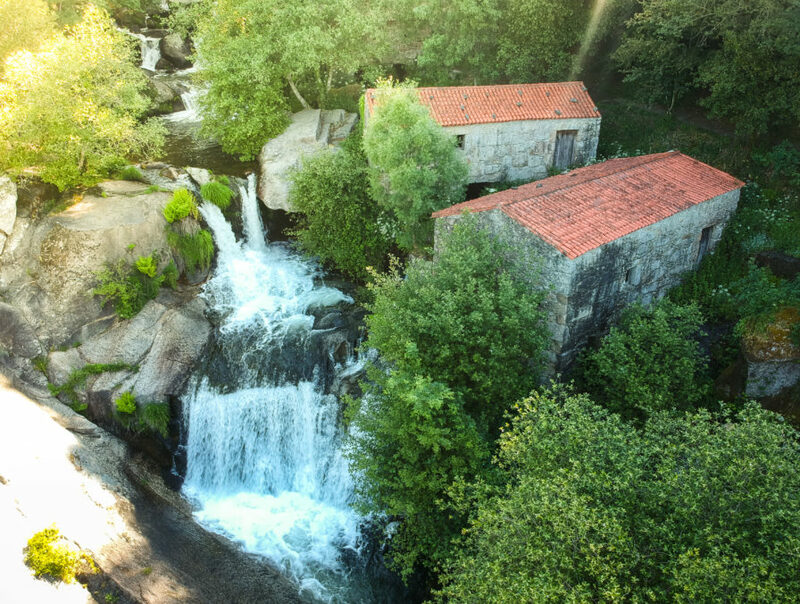 The water here flows down the Barosa river, past several small stone structures, through a network of small pools, and then eventually makes its way out to the nearby Atlantic Ocean. We spent more than an hour at the Cascada del Rio Barosa – exploring the nearby trails, hiking to the top of the waterfall, and eating snacks around one of the few picnic tables located at the bottom of the falls. This was one of the most memorable locations from the entire bike tour! After a long rest stop at the Parque natural del Rio Barosa, we jumped back on our bicycles and cycled the final 8 kilometers into the nearby city of Caldas de Reis, Spain. Along the way, we passed through small, stone villages surrounded by grape vines strung on wires stretching over the Camino footpaths. 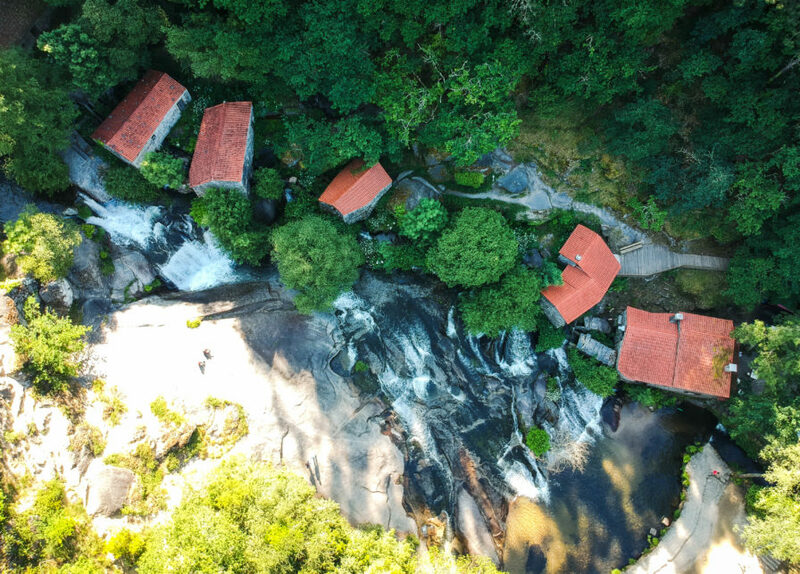 Once in the city of Caldas de Reis, we cycled uphill a short distance to the nearby Torre de Rio hotel, which was indeed a short distance out of the city, but totally worth the effort once we saw how beautiful this hotel was in its natural surroundings. The Torre do Rio is a hotel unlike any other I have ever stayed at before. In fact, it didn’t feel like staying in a hotel at all. If felt as if I had simply stumbled across a secret mountain chateau which happened to be owned by a close friend, and he invited me over for the night to enjoy his company. The hotel itself is really rather small, consisting of no more than a couple dozen rooms. But the grounds on which the hotel sits is absolutely massive – and it’s one of the most beautiful places I’ve ever had the pleasure of staying on any of my bike tours anywhere in the world. The Torre do Rio gets its name because the hotel is situated up high on the rocks overlooking a bend in the Umia river below. 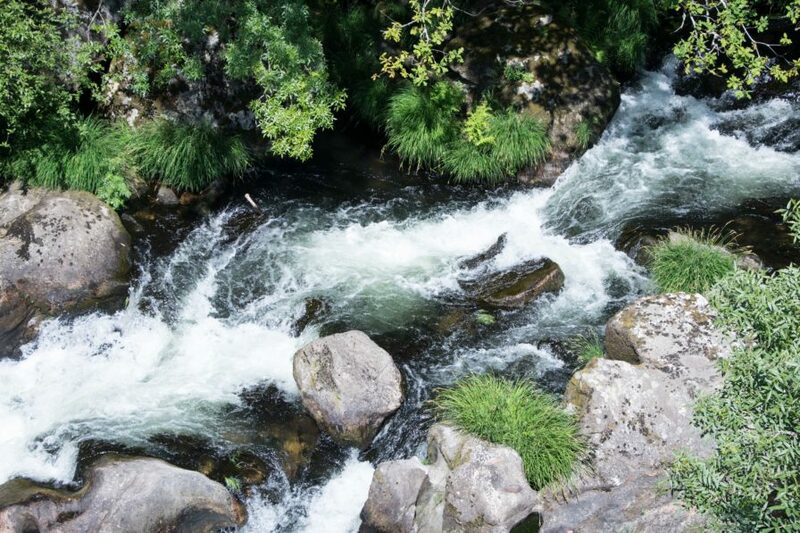 From the hotel, you can look down in almost any direction and see the water from the river making its way through the rocks on the river floor. I can’t quite explain just how incredible the Torre do Rio is. The hotel itself is constructed of stone and feels as though it were an estate built several hundreds years ago. The water from the Umia river flows through the grounds of the hotel and into the swimming pool, where you can go swimming or just lounge by the side of the pool and take in the sun. There are tables to eat at and plenty of secluded locations within the garden to drink wine or tea with a loved one. Inside the hotel, there’s a small dinning room, a library, a gallery and a lounge. Everything in the hotel is impeccably decorated. Once again, it feels as though you are staying in someone’s very nice home – not a cold, heartless hotel. The luxury that is so apparent on the outside of the hotel continues into your individual suite. 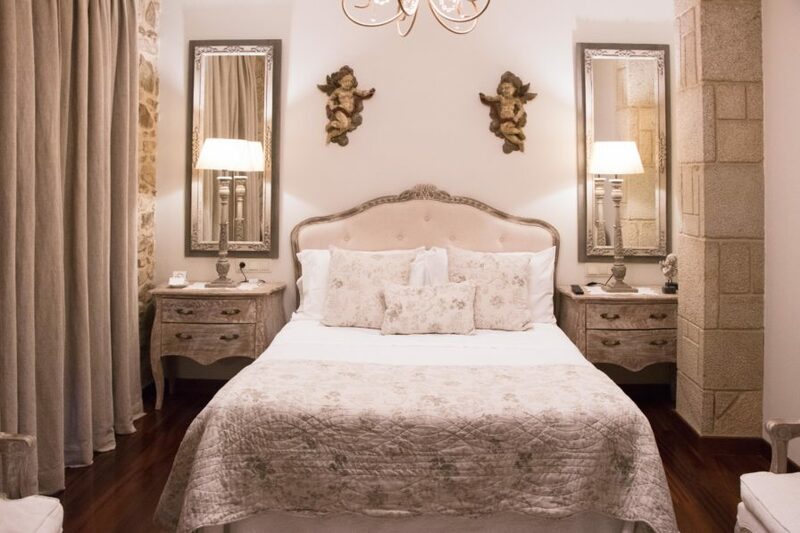 The rooms in Torre do Dio are beautifully decorated with ivory colors, fresh flowers in the bathroom, and chandeliers hanging overhead. The fact that this particular day of bicycle touring consisted of only 26 total kilometers was a good thing. It was a good thing because we were able to spend less time on the road… and more time enjoying our stay at the Hotel Torre Do Rio in Caldas de Reis. In the evening, the tour leads met us in front of the hotel and drove us down into the city center of Caldas de Reis. Once there, we walked around town for a while before settling on a place to eat dinner. 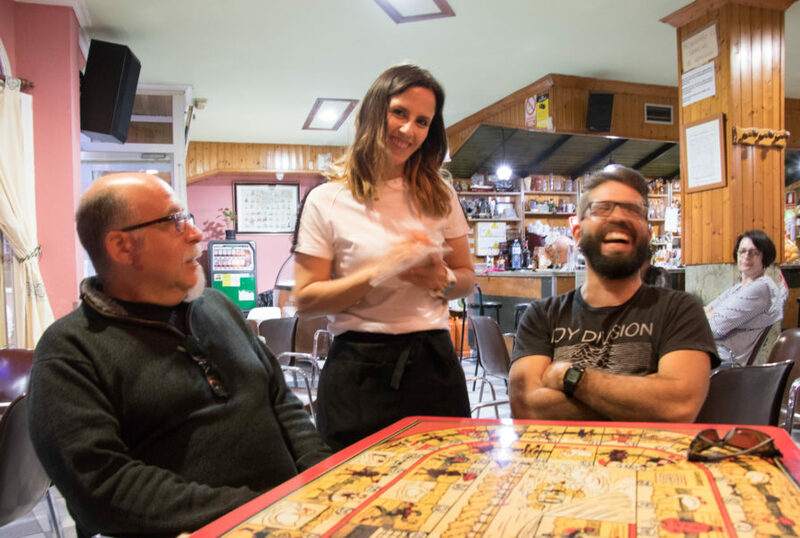 We ordered yet another delicious meal filled with classic Portuguese cuisine and chatted joyfully with the people who, at this point in the tour, had quickly become close friends. 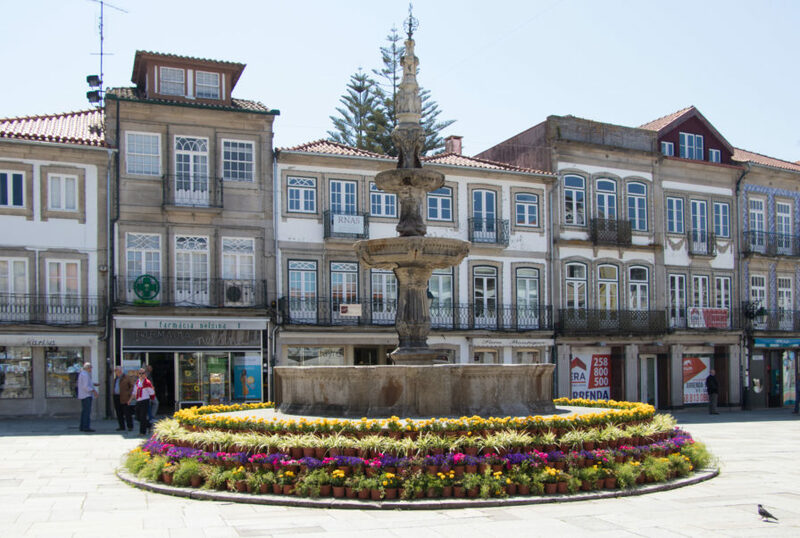 After eating, we walked out onto the streets of Caldas de Reis and made our way to the nearby thermal foot-baths, where we removed our shoes and soaked our feet in the warm water. During the day, these hot springs are used by the numerous pilgrims making their way to Santiago de Compopstella to wash their feet and relax after a long day of hiking on the road. But at night, when we were there, we had the entire place to ourselves… and we delighted in the peace and solitude of the bath’s warm water, knowing that we only had one more day of cycling ahead of us before we reached the final destination on our Portuguese and Spanish cycling holiday. 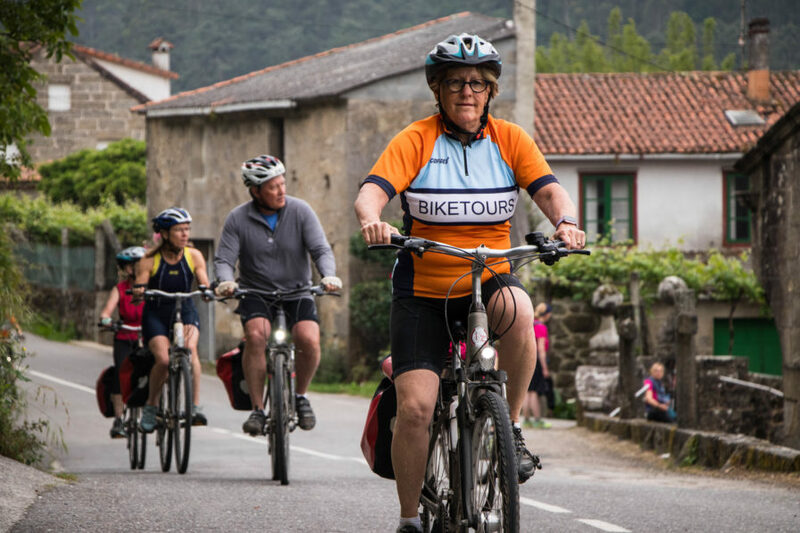 The air was filled with excitement on the final day of our week-long bike tour to Santiago de Compostela in northern Spain. 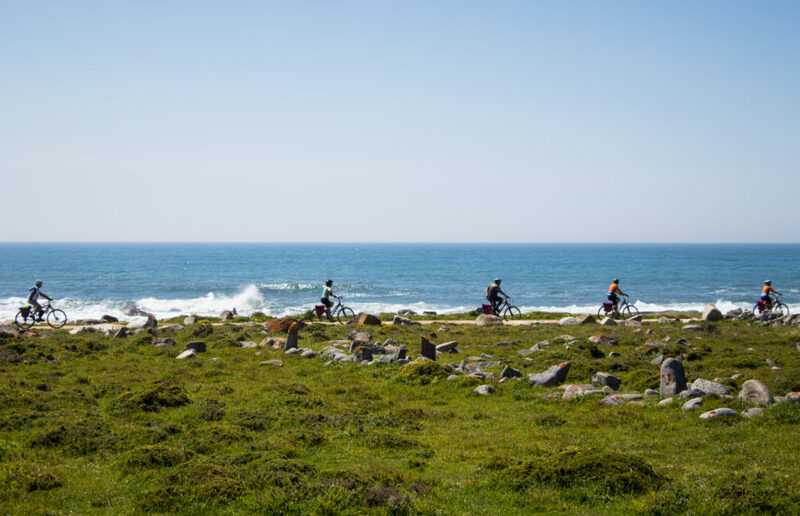 Twenty-five individuals from all around the world had gathered in Porto, Portugal and ridden for five full days to the north. Now, on this particular day, we all knew we were getting close. 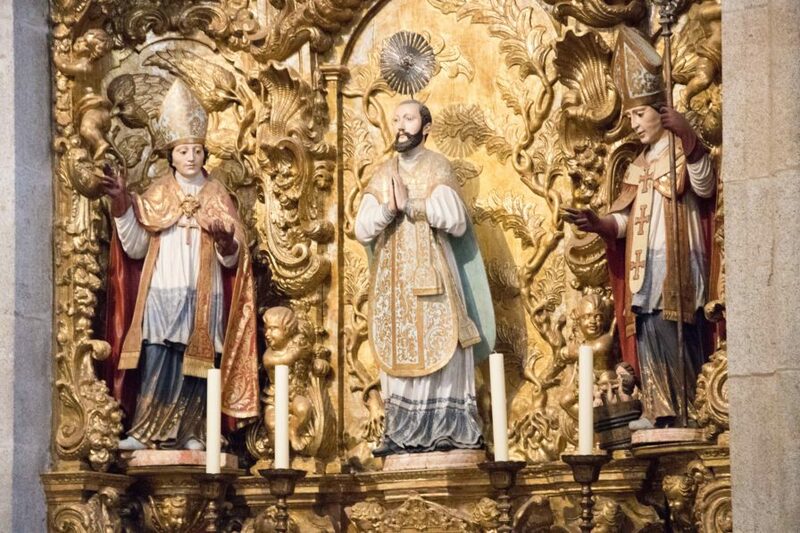 There was now only 40 kilometers to go before we reached the shrine of the apostle Saint James the Great in the cathedral of Santiago de Compostela. Traffic was heavy on the Camino footpaths on this particular day, but the spirits of everyone on the trails was high. Hikers on the trail were now only a day or two away from reaching the end of their journey, as those of us participating in “The Way of St. James Bike Tour” knew that by the end of the day we would have completed our cycling pilgrimage. The scenery on this last day of the tour did not disappoint. There were times when we found ourselves cycling on narrow dirt trails that passed through shaded forests… and other times where we were able to bike along easily on beautiful paved roads that passed through small towns and villages. 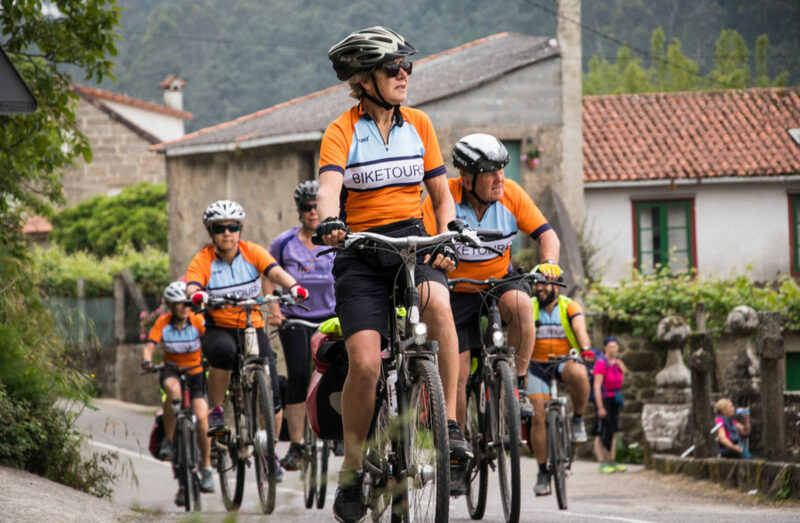 All along the way, locals and pilgrims alike greeted us with friendly smiles – many of them shouting “Buen Camino!” as our group slowly cycled past. 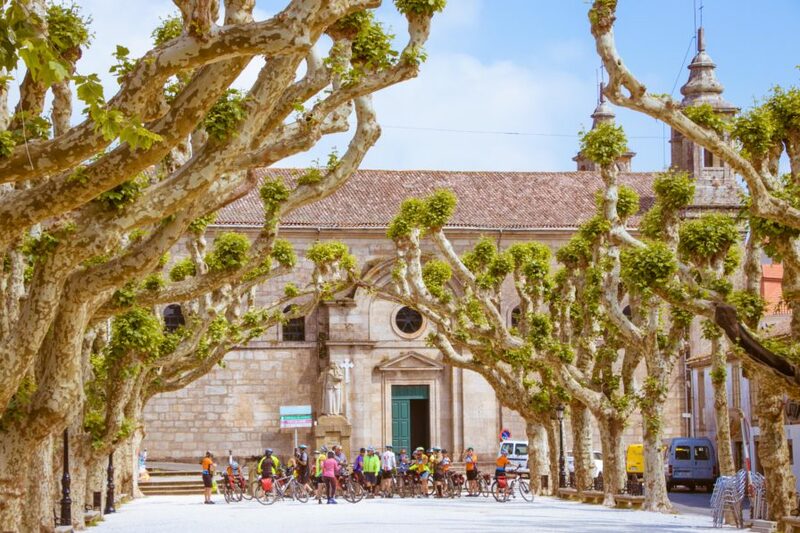 As lunchtime drew near, we found ourselves cycling into the center of Padrón, Spain – a town with great religious and historic significance, located just 23 km from Santiago de Compostela. We parked our bicycles in the park across from the Santiago Apóstolo church and the Convento do Carme, which is located on the hill on the other side of the river Sar. Free to explore the city and eat wherever we liked, we wandered around the streets of Padrón in small groups and eventually made out way back to the park where our tour leaders were waiting for us. Our Top Bike Tours Portugal tour leaders, from left to right: Tiago, Sergio, Jose and Pedro. In what felt like no-time, we found ourselves in the center of the city and standing in front of the famous church in Santiago de Compostela. We had done it… and the tour leaders from Top Bike Tours Portugal were the first to congratulate us on the completion of our ride. I was surprised, actually, at how relaxed the scene was outside the church in Santiago de Compostela. I had expected there to be tons of people running around, selling T-shirts and souvenirs, trying to make money off of the hundreds of pilgrims coming in each day on food and by bicycle. But it wasn’t like that at all. The courtyard outside the church was filled with people, buy there were no salesmen in sight. People were calmly staring up at the church, talking with one another in small groups, sitting together in the stone courtyard or laying on their backs and looking up at the clouds. It was a quieter conclusion to the trip that I had anticipated. And even though it wasn’t quite what I had expected, I enjoyed the moment and was happy that my expectations had not been accurate. 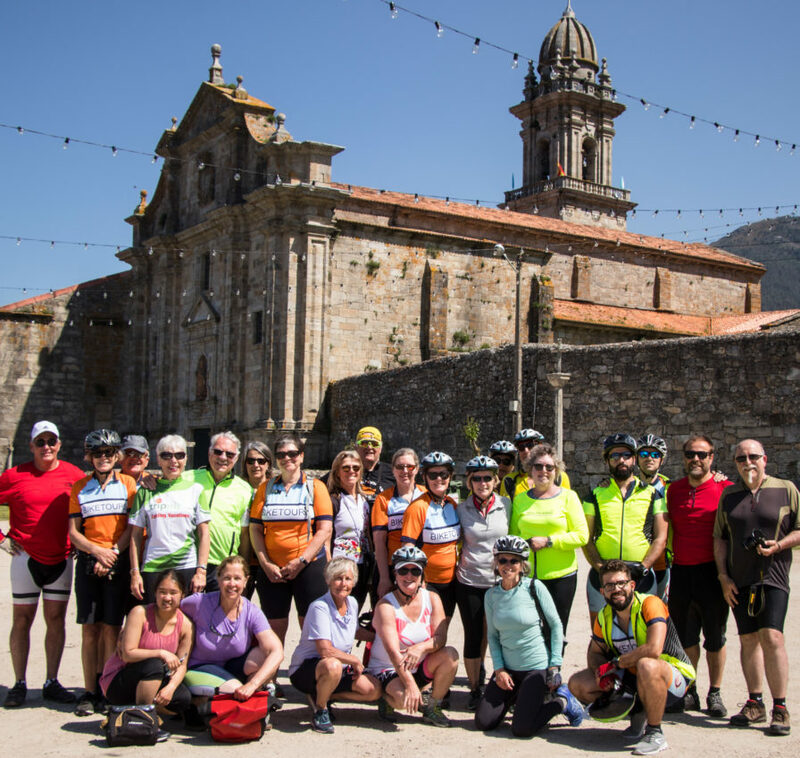 After we had some time to digest the fact that we had just reached the end of our cycling excursion, we gathered together for a group photo outside the Cathedral of Santiago de Compostela. We took one group photo with the tour leaders and all of the tour participants (I’m not in the photo though, because I’m behind the camera). Then we took another, smaller group photo with me and my Bicycle Touring Pro readers who joined the tour after I announced months before that I would be participating in this particular cycling adventure. 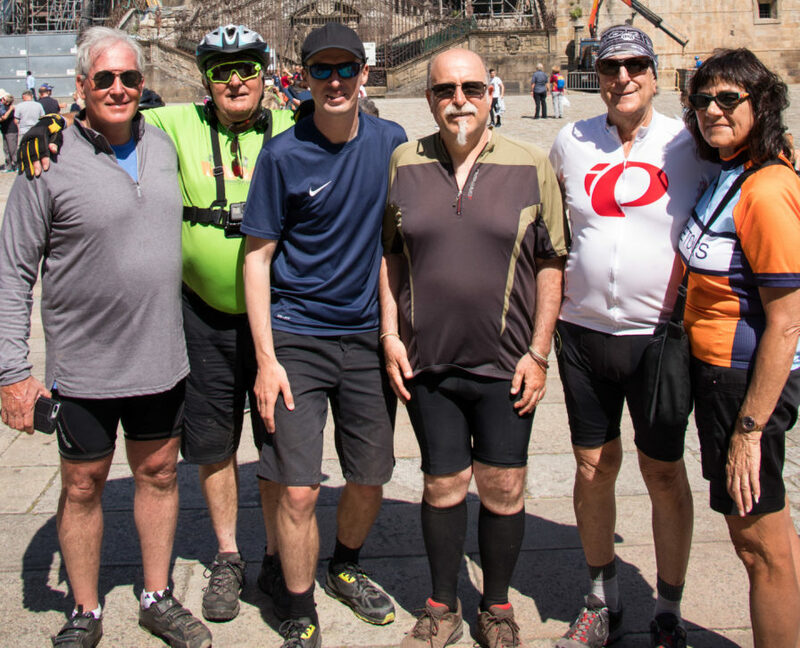 I think I can safely say that all of my Bicycle Touring Pro followers were glad that they joined the bike tour… and were happy to have reached the cathedral in Santiago de Compostela on this final day of the cycling. After taking dozens of photos, we were guided across the city to our hotel for the night – Hotel Compostela. 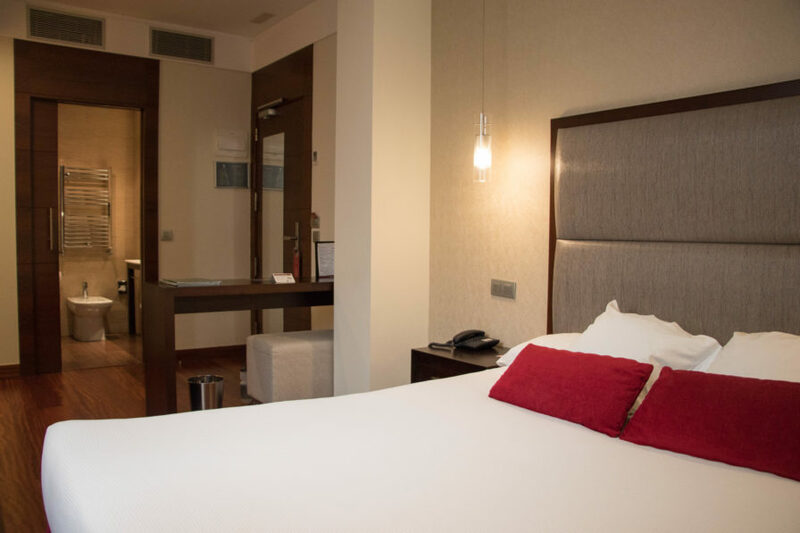 This bustling city-center hotel was crowded with people, but was located just outside the walls of the city center, making it the perfect launchpad for our night of exploration in Santiago de Compostela. After taking a shower, I left the hotel and wandered around the city center, well into the night. During my walk I stumbled past the Mirador Costa Vella, the Museo e Iglesia de San Martín Pinario and several other historic landmarks and tourist attractions scattered throughout the city. It was interesting to just sit and watch the people wandering about. Some of the people, I know, were locals, who have walked these streets hundreds or thousands of times in their lifetime. While others, I knew, were pilgrims like me, who came to Santiago de Compostella for a wide variety of reasons. Some come to the cathedral in the center of the city for religious reasons, while others chose to come there for the history. Some make the pilgrimage to Santiago de Compostela because they saw a film about the Camino and decide, for one reason or another, than this looked like something they might like to try themselves. 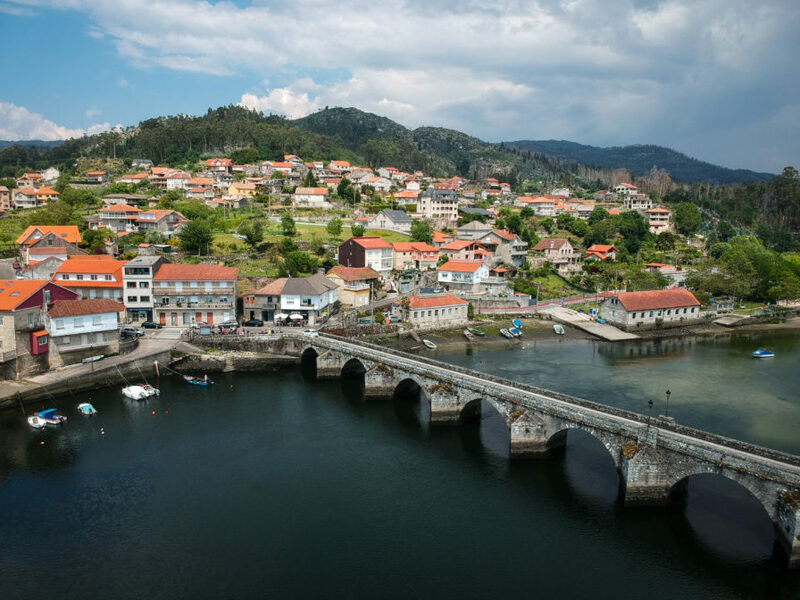 And others, like myself, come to this scenic city in northeastern Spain because it’s not really about the place itself, but more about the experiences you have getting there along the way. 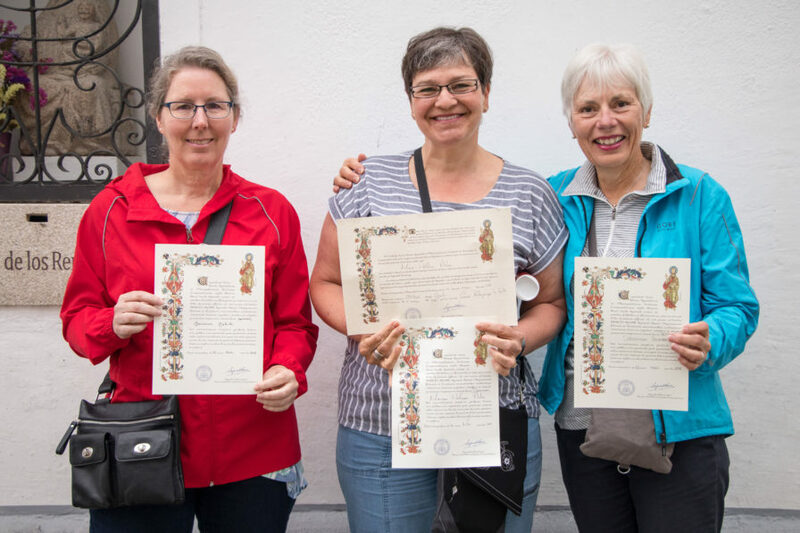 After a relaxing night in Hotel Compostela, we woke up early and walked to the Oficina de Acollida ao Peregrino (Pilgrim’s Reception Office) where we stood in line for about an hour before being presented with certificates declaring our successful completion of the Camino. Then, we were all loaded up in a series of vans and driven back to Porto, Portugal, where our week-long cycling holiday in northern Portugal and Spain ultimately came to an end. Some of us stayed in Porto for another couple days. 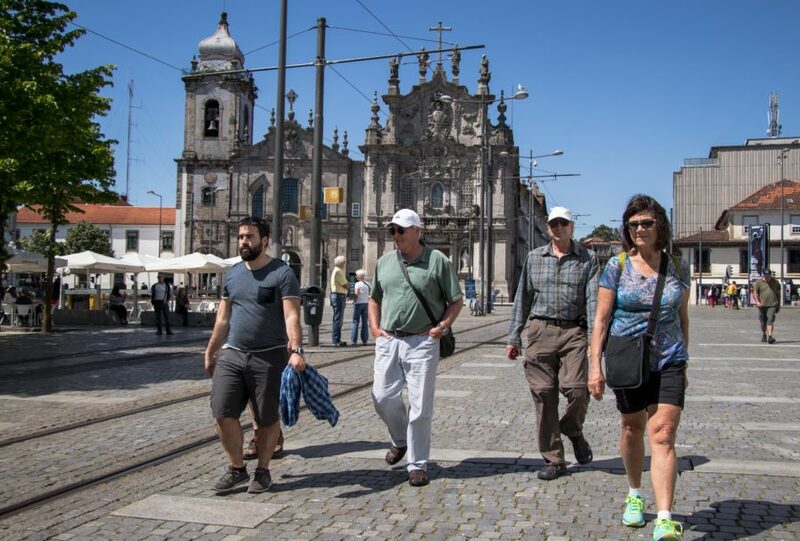 Others traveled south to Lisbon for more adventures in Portugal. And others in the group were taken straight to the airport for their flights home. May not have the most bicycle touring experience. 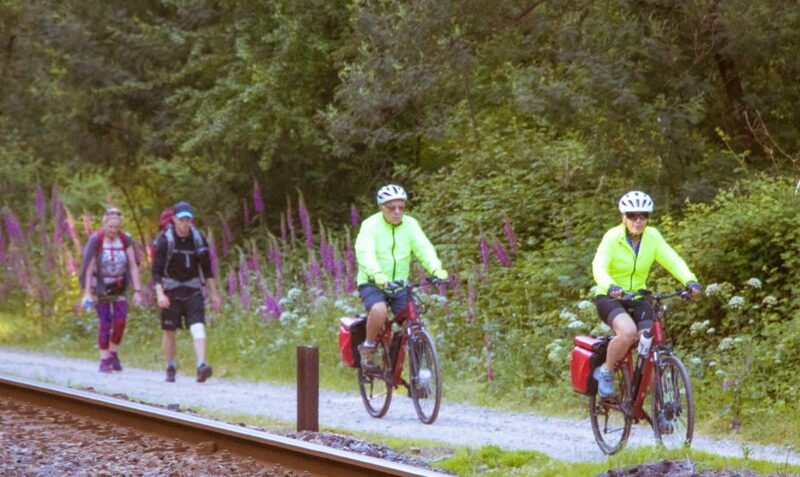 This is a bicycle touring holiday that almost anyone can do. 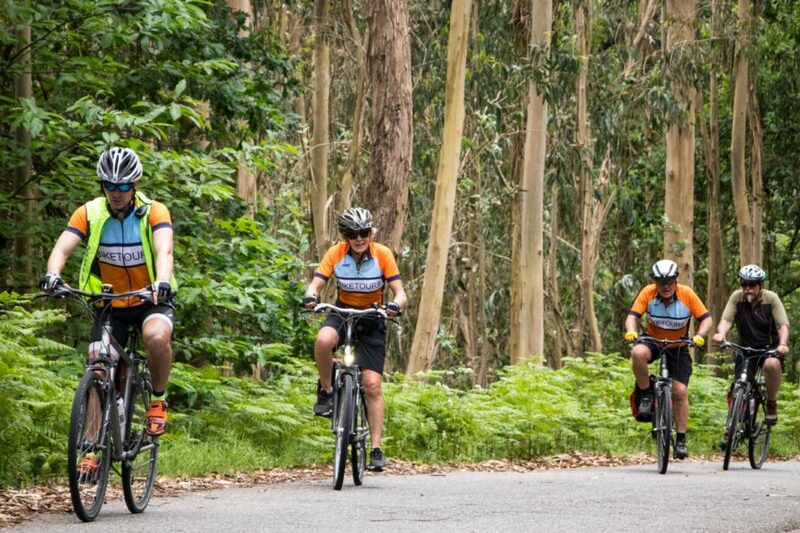 It’s classified as an easy to moderate bike tour, because the route is almost entirely flat, but there are a couple very short, steep climbs where you may have to get off your bike and walk uphill. You need to be in decent physical shape to complete this tour, but you don’t need to be a seasoned bicycle rider. 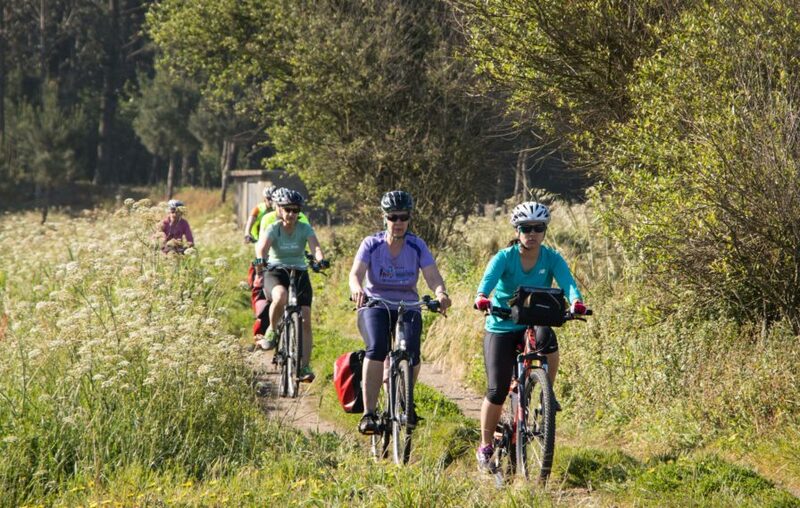 Casual cyclists with a just a small amount of bike riding experience will be perfectly suited for this bike tour. The distances each day are rather short (with the shortest day being 26 km and the longest day being 60 km). There are some bumpy cobblestone sections, however, so be prepared for that. 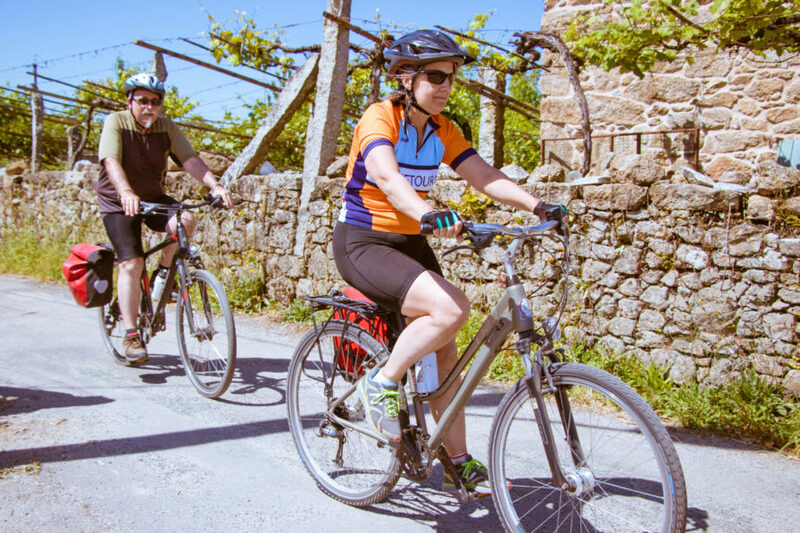 Individuals wanting to experience the Camino on a bicycle. 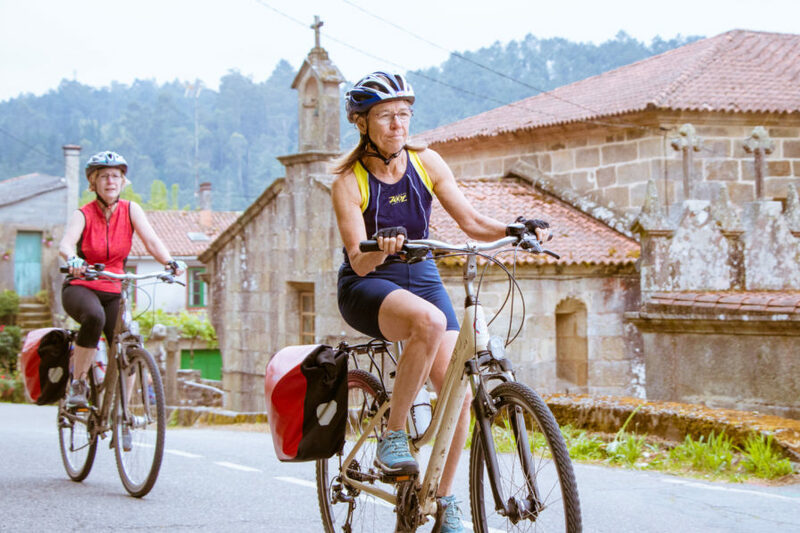 If you’re someone who has dreamed of traveling the Camino trail to the cathedral in Santiago de Compostela for religious or spiritual purposes, or you’re just someone who sees cycling the Camino as something fun to do, you’ll really enjoy “The Way of St. James Bike Tour,” regardless of your motivations. Want a nice bed, a warm shower and a good meal every single day. If camping in a tent or going for days on end without a shower is not your thing, then this might just be the bicycle tour you’ve been looking for. On “The Way of St. James Bike Tour” with Top Bike Tours Portugal, you get all the benefits of traveling long distances on a bicycle, but at the end of the day you’ll be able to stay in high-end accommodations, take a hot shower, eat a delicious meal, use the Internet to stay in touch with friends and family back home, and still have time to relax and enjoy the company of your fellow travel companions. Don’t want to waste time planning a tour like this on their own. 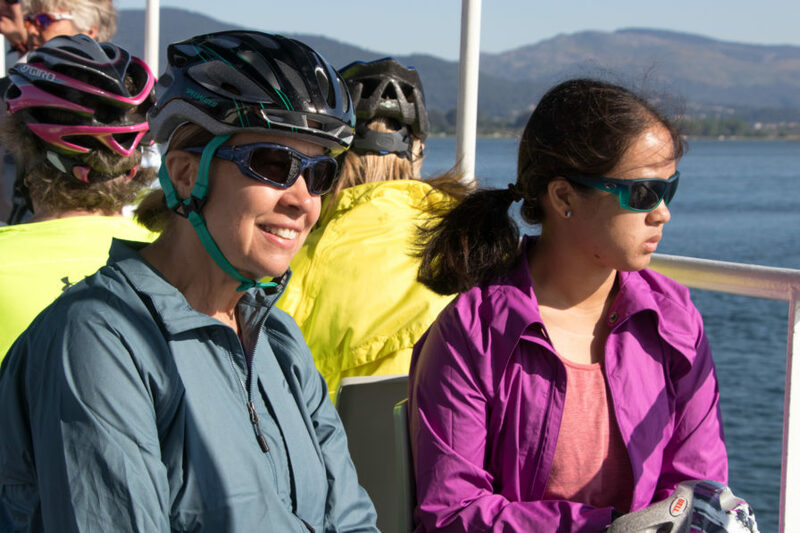 Participating in this guided or self-guided bicycle tour takes all the time, energy, and grunt work out of planning your holiday. 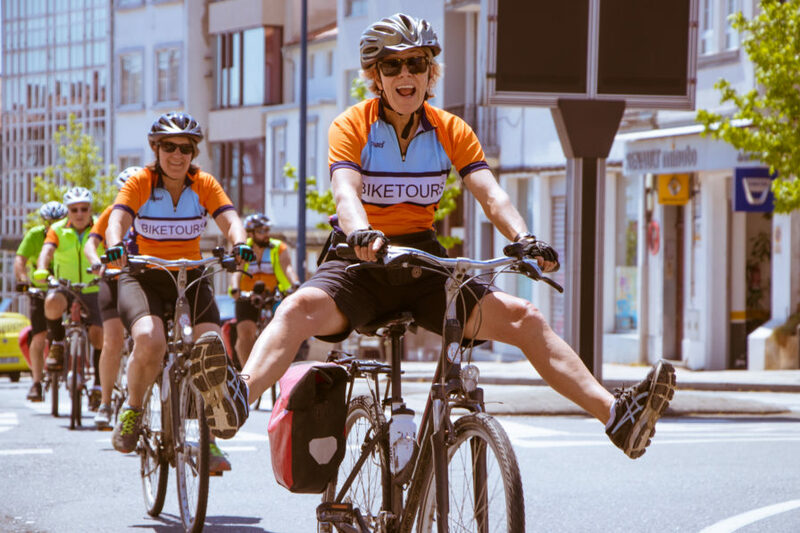 Instead of spending countless days and hours on the computer, researching possible routes and places to stay, just call up Top Bike Tours Portugal (or send them an message) and they will do all the hard work for you. 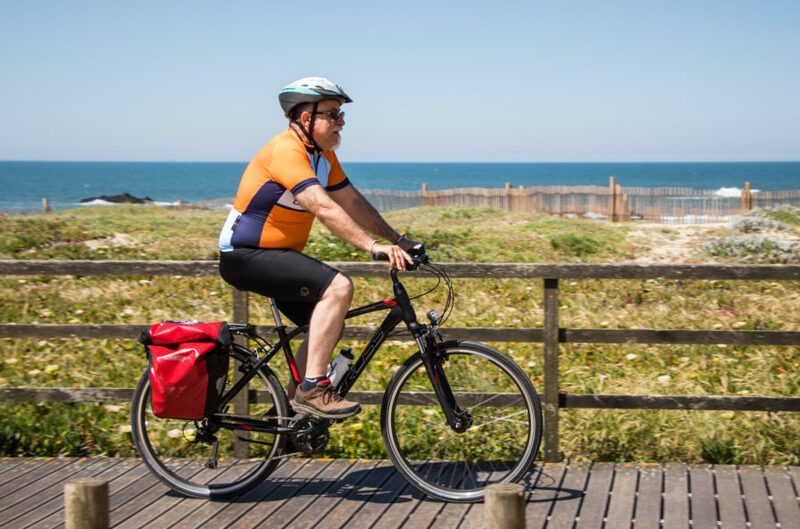 After your accommodations have been booked, your only job is to show up for the start of the tour, follow the instructions that have been provided for you by the company, and enjoy a week of cycling and relaxation in northern Portugal and Spain. Don’t want to transport their bicycle all the way to Portugal. 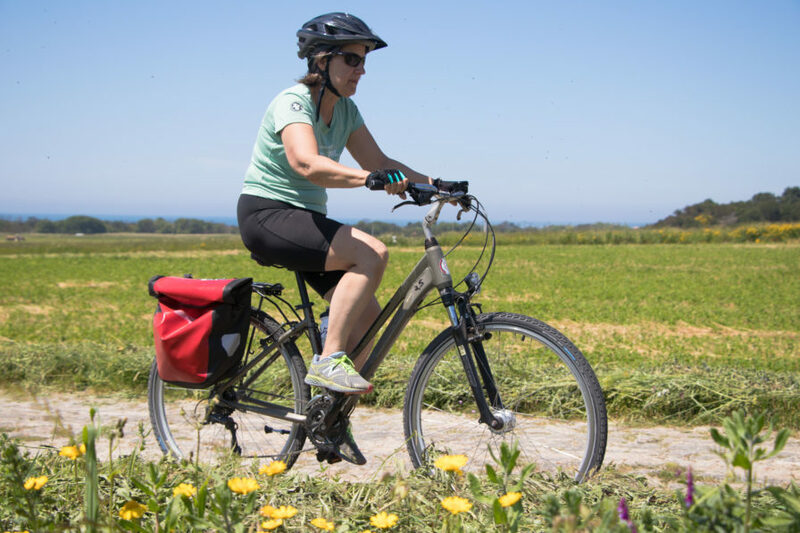 You can leave your bike at home on this cycling trip, because Top Bike Tours Portugal will have a quality trekking bike waiting for you when you arrive in Porto at the start of the tour. If you want to bring your own saddle or pedals from home, that’s fine too! Top Bike Tours Portugal will work with you to get the bike fitted to you and your unique body type. Don’t want to carry a bunch of heavy gear on your bicycle as you ride each day. 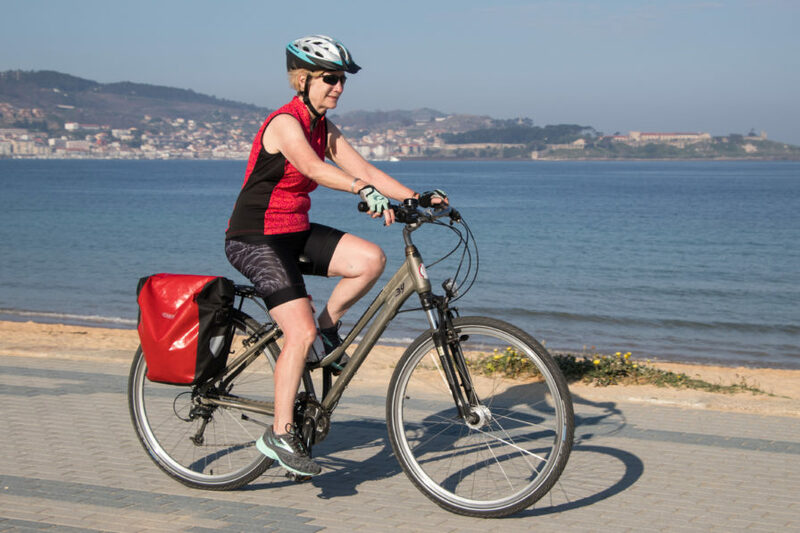 When you participate in a guided bicycle tour with Top Bike Tours Portugal, the company will transport your clothing, toiletries and other belongings for you – moving your things from one hotel to the next, so you don’t have to carry everything with you on your bicycle as you ride each day. This is huge bonus for individuals wanting the most enjoyable cycling experience possible. While this service is included for free as part of a guided bike tour, luggage transport is not included in the regular price of the self-guided tours. However, luggage transport is available for self-guided tour participants for an extra fee. 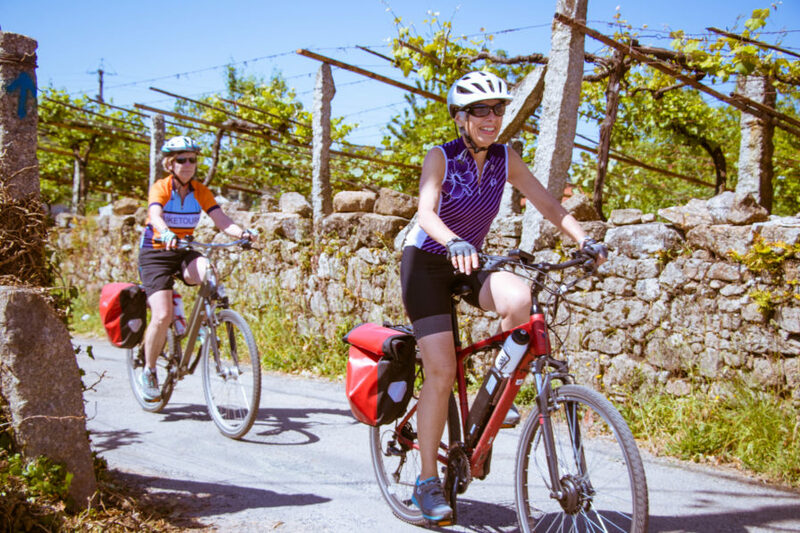 Top Bike Tours Portugal has organized “The Way of St. James Bike Tour” in such a way that you get to stop and enjoy yourself each night in some of the best accommodations in all of northwestern Portugal and Spain. 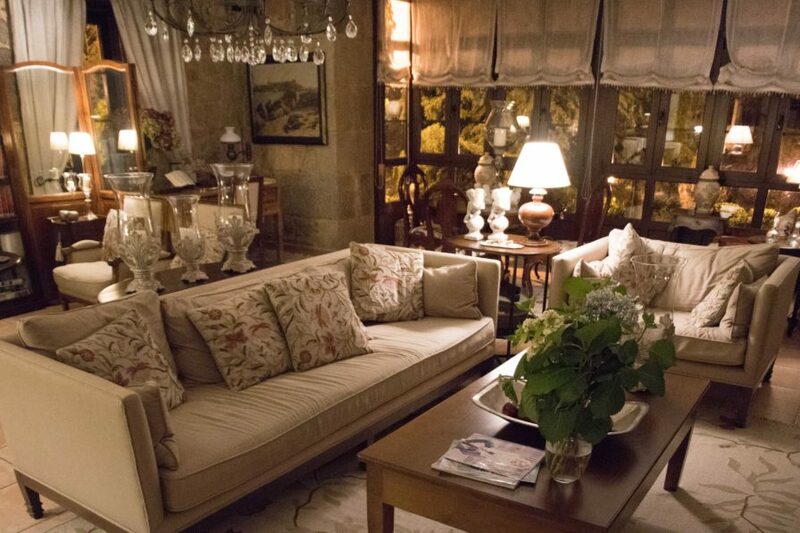 The hotels you’ll be residing in each night during your pilgrimage to Santiago de Compostela are welcoming, luxurious, and unique in their own very special ways. 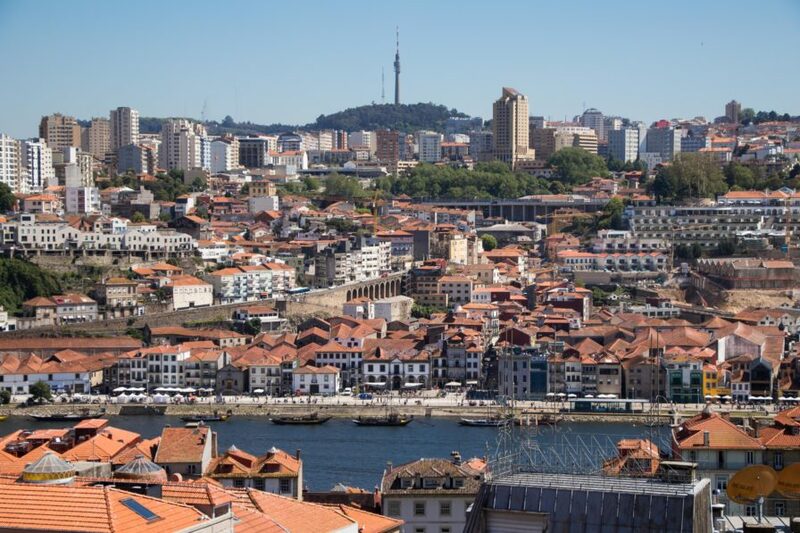 The Porto Trindade Hotel in Porto, Portugal is the perfect place to begin your journey in northwestern Portugal. 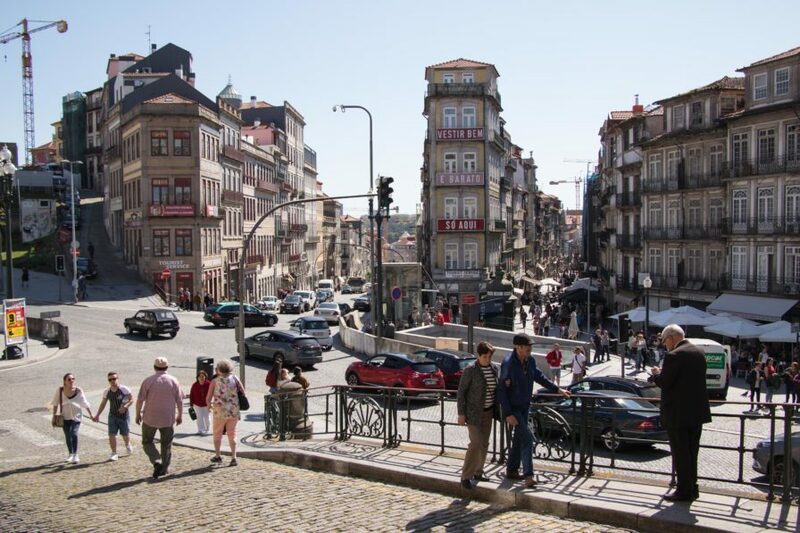 This tall, modern business-style hotel with European flourishes is located just across the street from the Trindade metro station and only a couple hundred meters from the Top Bike Tours Portugal bike shop – making it easy to get to… and an ideal launchpad for exploring the city of Porto on foot or by bike. 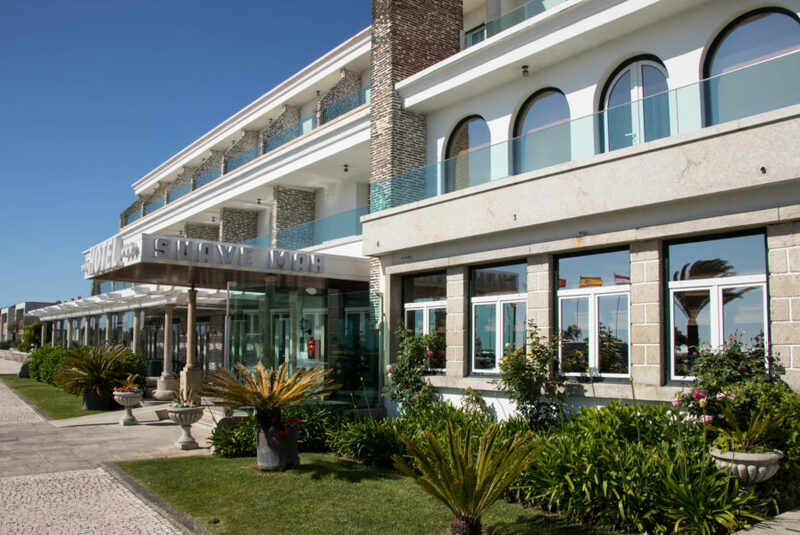 Located just a short distance from the oceanfront, Hotel Suave Mar in Esposende, Portugal is a large, beautiful hotel with a swimming pool and balcony views of the Atlantic Ocean. From your room you can sit on the balcony and stare out at swimmers in the pool, cyclists on the nearby bike path, joggers on the sidewalk or surfers in the sea. 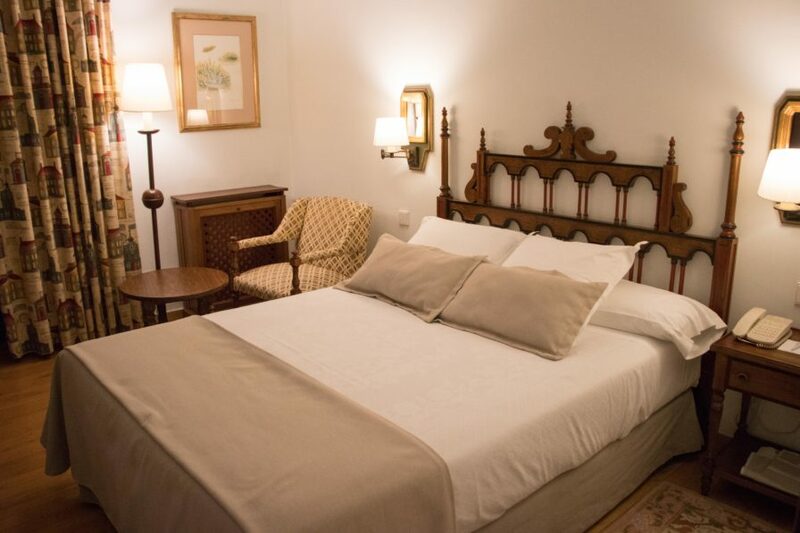 The hotel features large, clean, beautiful rooms with comfortable beds and a delicious buffet breakfast. 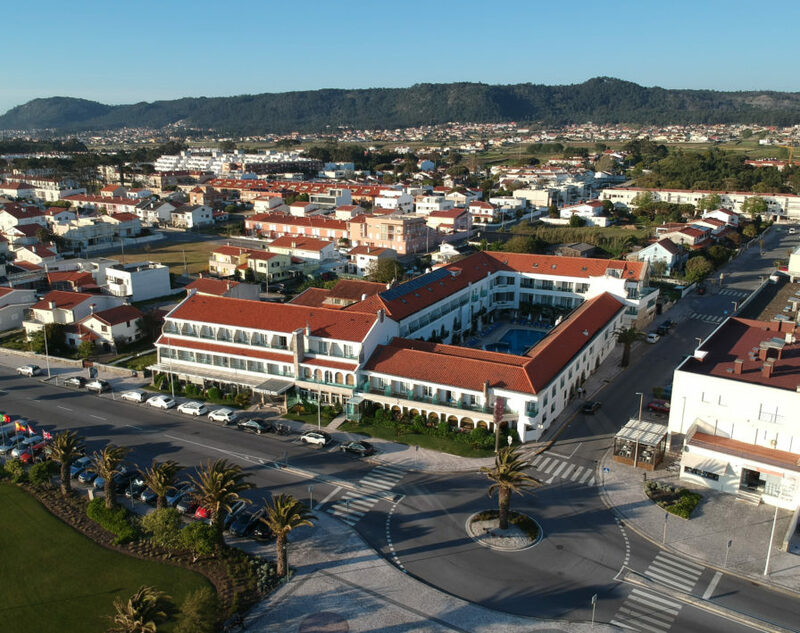 Porta do Sol is a large, conference-style hotel located just a short distance from the charming city center of Caminha, Portugal. 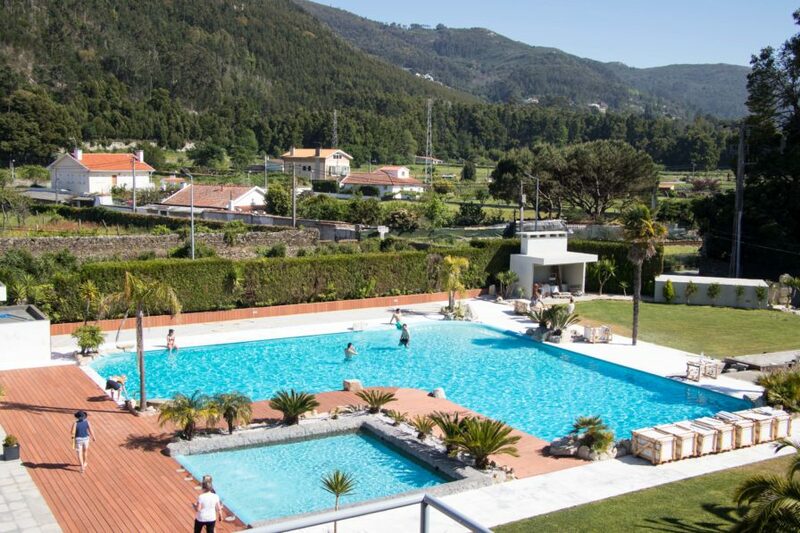 Rooms on the west side of the building face toward the Rio Minho and the Atlantic Ocean, while rooms on the east face toward the swimming pool and the mountains. 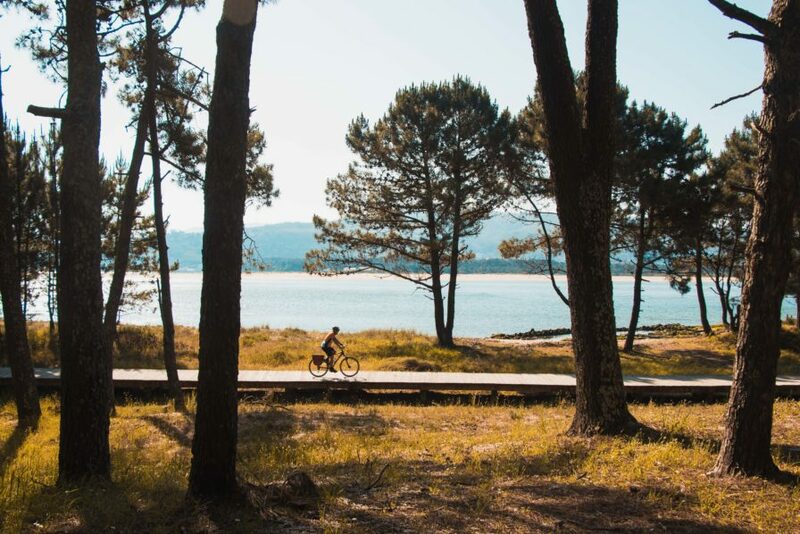 If you stay in Hotel Porta do Sol, be sure to take a dip in the swimming pool, take a stroll along the boardwalk to the nearby Parque Orbitur Caminha, and dine at the hotel’s in-house restaurant. 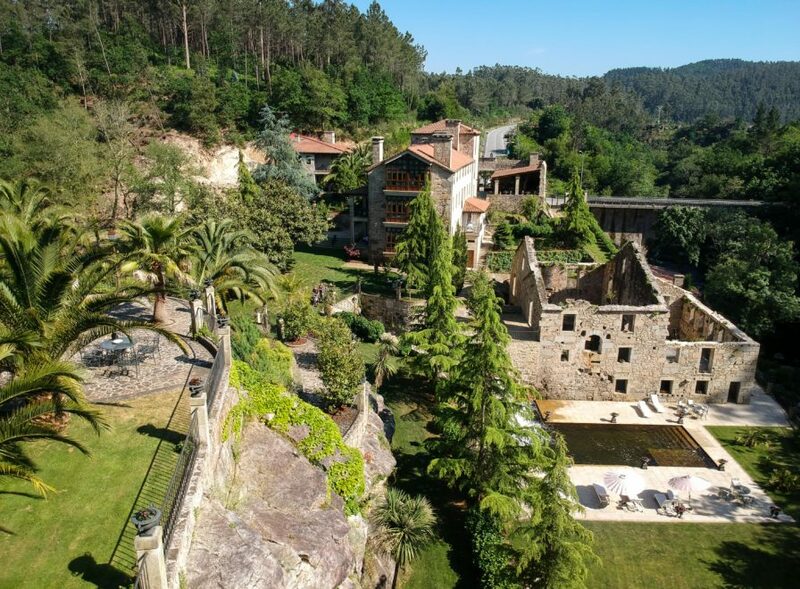 If you’ve ever wanted to experience what it’s like to live in a castle, then a stay at the Parador de Baiona in Bainona, Spain is an absolute must. The hotel itself is a large, rectangular structure built of stone, with long corridors leading to dozens of charming medieval rooms. But don’t spent all your time here in your room, because it’s the property outside the hotel that makes this place so very special. 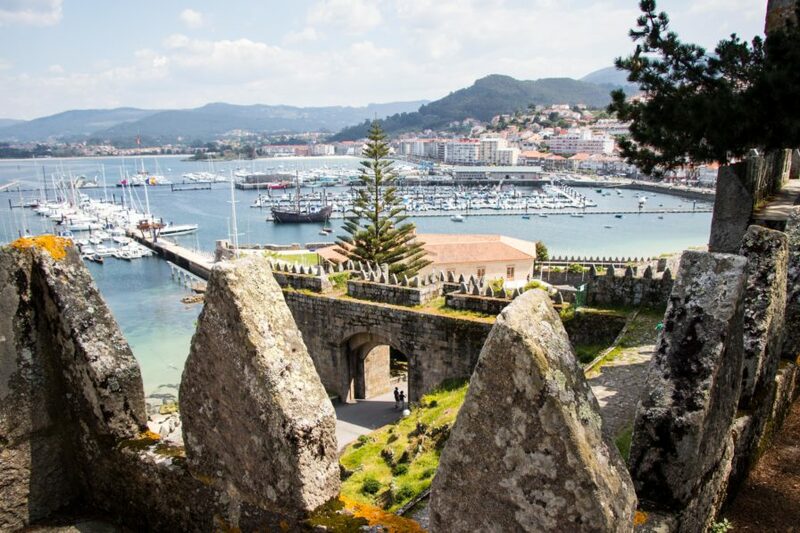 Be sure to walk the castle walls, take photos of the nearby islands and peer through the stone turrets at the sailboats, sunbathers and summertime tourists sitting in the city below. 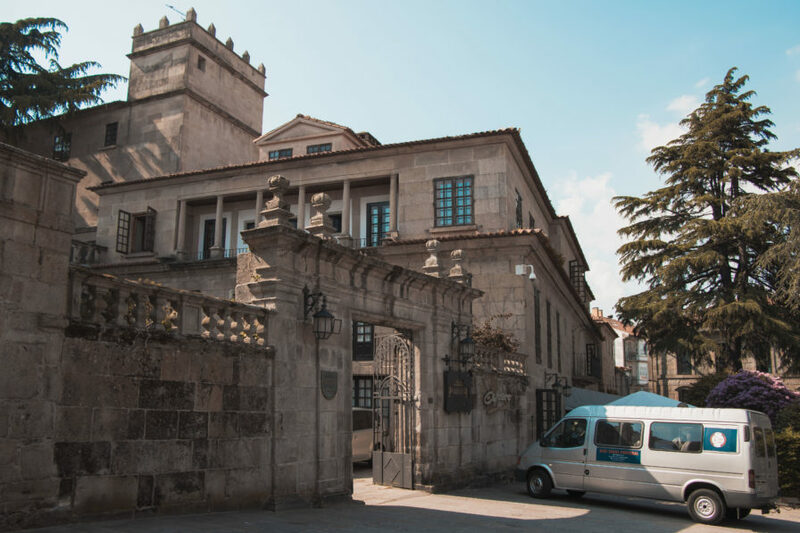 Owned and operated by the same company that runs the Parador hotel in Baiona, the Parador de Pontevedra hotel in the walled city of Pontevedra, Spain is decorated very similarly on the inside, with medieval flourishes throughout. 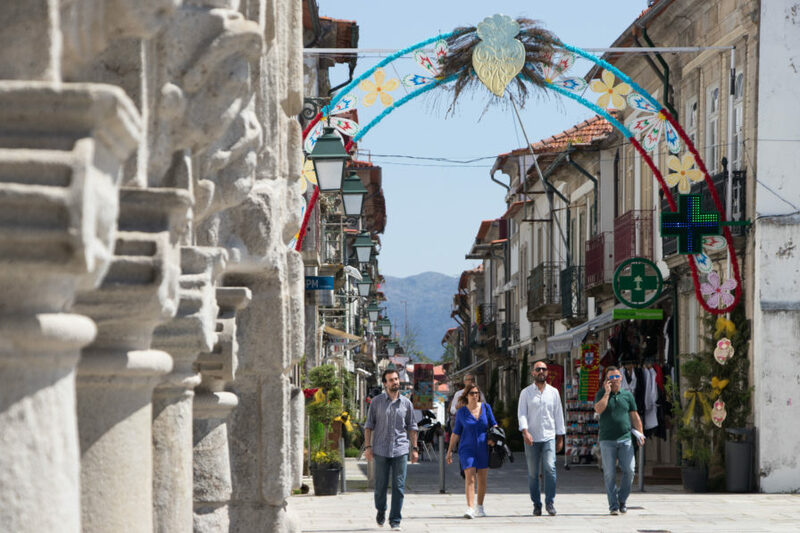 While the outside of the hotel is not nearly as impressive as its sister hotel in Baiona, the city of Pontevedra is a charming little place in and of itself, with a network of narrow stone streets that are perfect for exploring on foot. 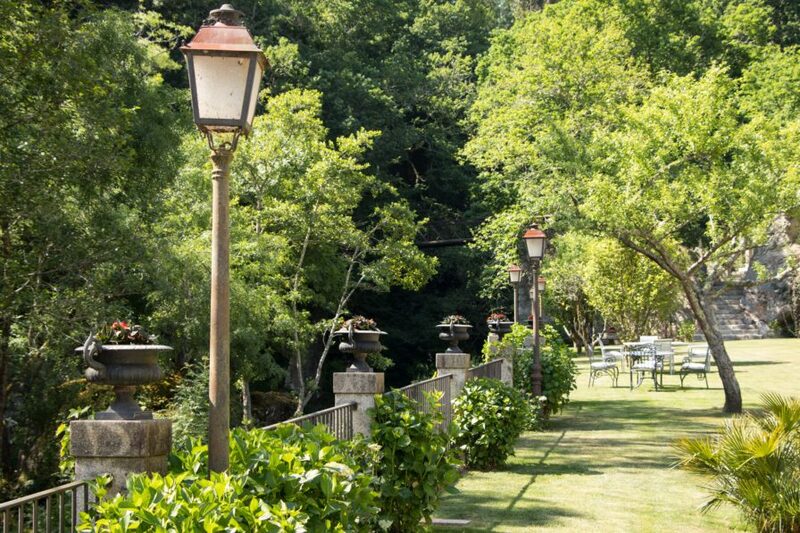 Both Parador hotels in Baiona and Pontevedra boast a delicious buffet breakfast. 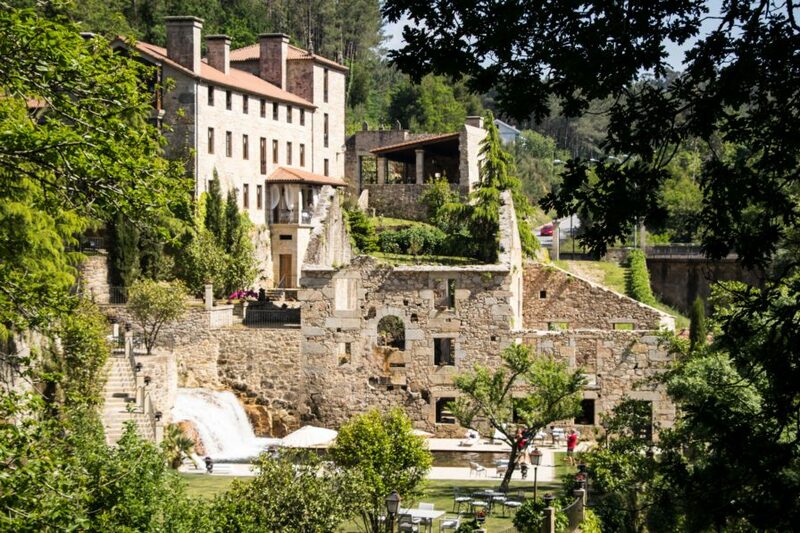 The Torre do Rio hotel in Caldas de Reis, Spain is a true gem. While the hotel is located a short distance (and up a hill) outside the city center, the climb up to the hotel is worth the extra effort. This place is absolutely magical. In fact, it’s one of the most memorable hotels I’ve ever stayed at anywhere in the world! 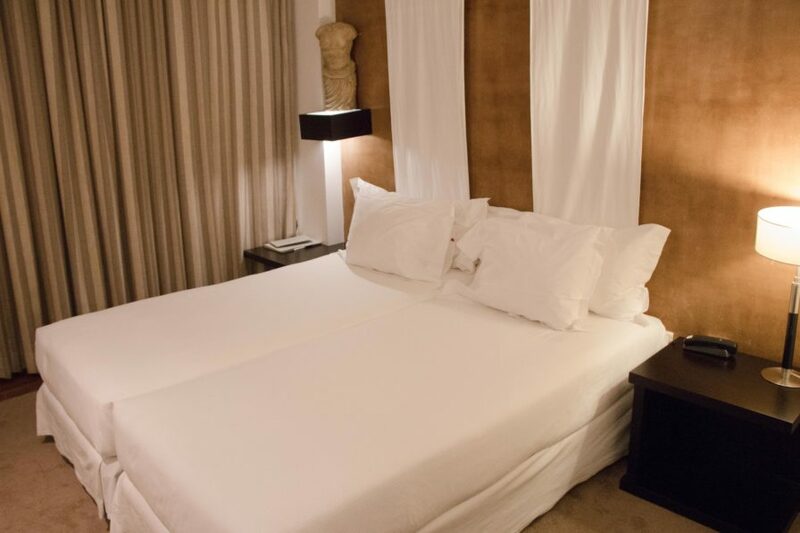 Surrounded by the Rio Umia on three sides, the Torre do Rio features a large waterfall flowing into the swimming pool, majestic gardens, a spectacularly designed dining room, and luxurious beds that are fit for a king and queen. 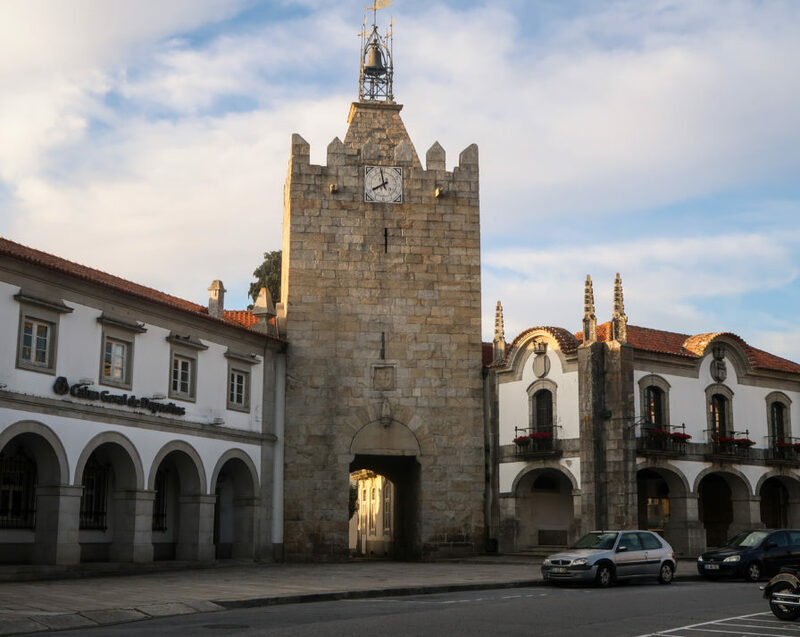 On the last night of “The Way of St. James Bike Tour” with Top Bike Tours Portugal, you’ll spend the evening at Hotel Compostela – located just a short distance from the cathedral that serves as the final destination for the pilgrims hiking the Camino. 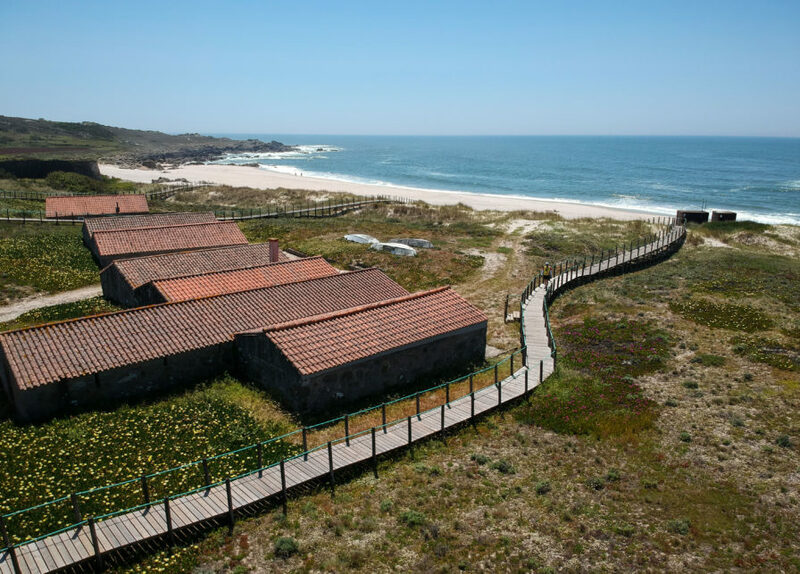 The outside of the hotel may not be super memorable, but the rooms are large and the location is ideal for the very last night of a week-long cycling adventure in northwestern Portugal and Spain. “The Way of St. James Bike Tour” can be booked as either a guided bicycle touring experience (where you are escorted along the route by two or more experienced guides – as you see in my written/photographic review above) or the tour can be done as a self-guided cycling experience (where you will be traveling on your own, without a guide). Either way, this is a bike tour that can be done alone, with a family member, loved one or with a friend. 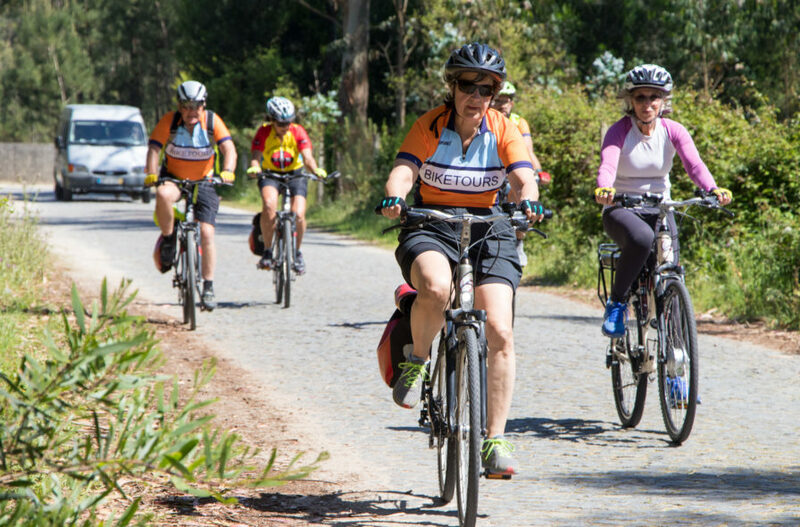 If you choose to do the bike tour as a guided cycling experience, you will be subject to riding with the group and cycling at their pace. Whereas, if you chose the self-guided cycling experience, you get to choose the pace at which you travel. You can sleep in late or wake up early. You can cycle super fast or pedal really slow, while stopping to see and explore things throughout your ride. The choice is up to you – guided or self-guided? 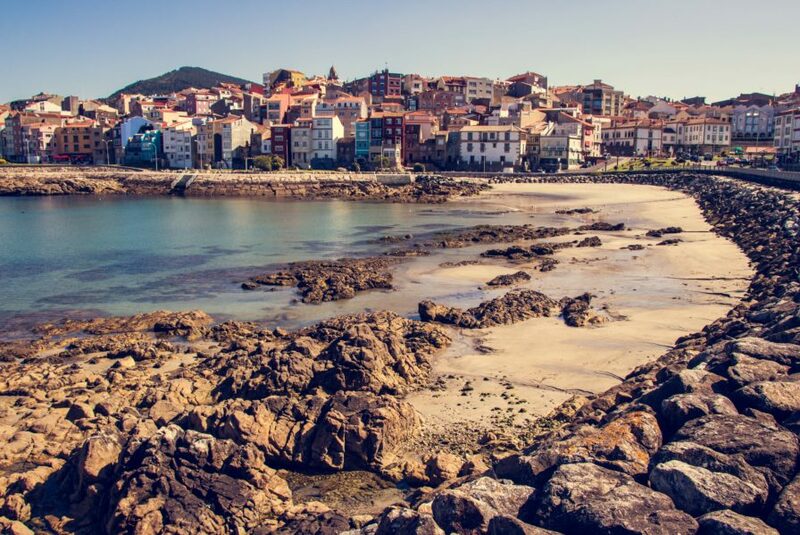 In addition to the cost of the bike tour itself, you will need to get yourself to Porto, Portugal for the start of the tour. 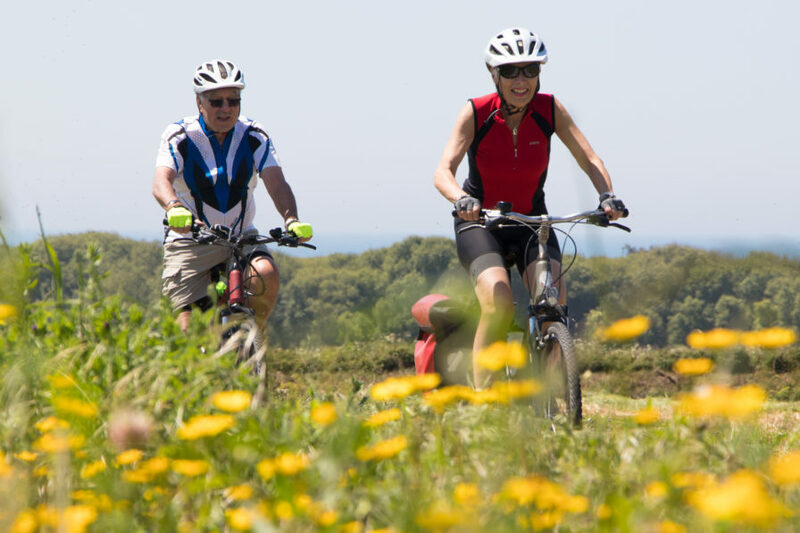 Top Bike Tours Portugal will provide you with all the information you need to get to the start of the trip and may even be able to arrange for transfer to your hotel when you either fly into the city or arrive by train. At the start of “The Way of St. James Bike Tour” you will be given a packet of papers containing all the information you need for the duration of the trip. This packet of papers contains maps of the routes you will be cycling each day, information on the sights you can expect to see throughout the tour, your hotel information each night, and contact details for the tour company in case of an emergency. 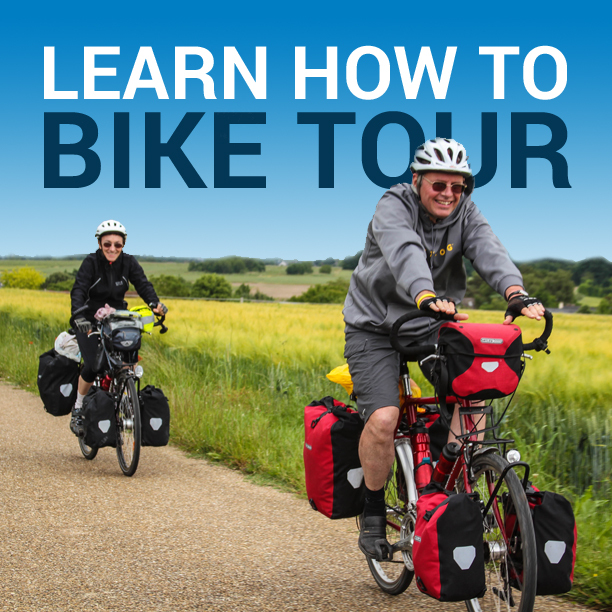 You can choose to bring your own bicycle with you on this bike tour, but most people simply opt to use one of the bikes provided by the touring company. This way you can simply show up in Porto, Portugal at the start of the tour and have a bicycle waiting for you when you arrive. 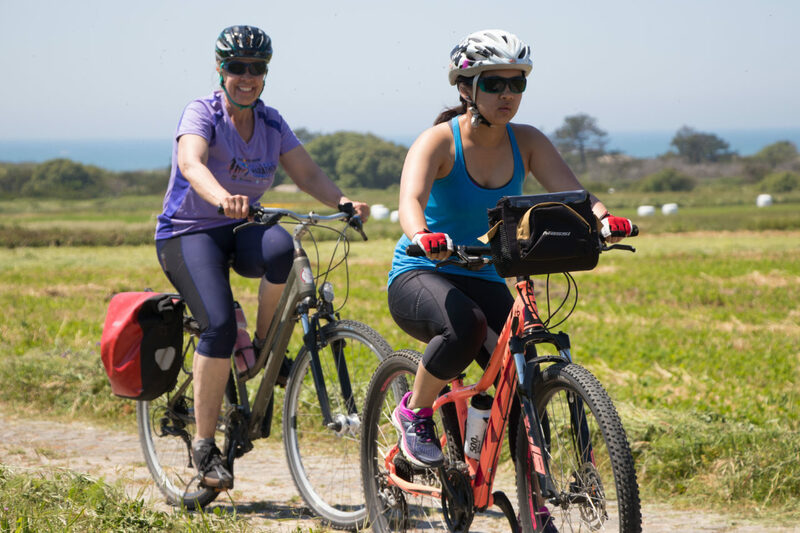 There is no cost associated with renting a bicycle from the company when you book this tour as a guided group experience, but there is an extra fee for renting the bike when you book this trip as a self-guided bicycle tour. 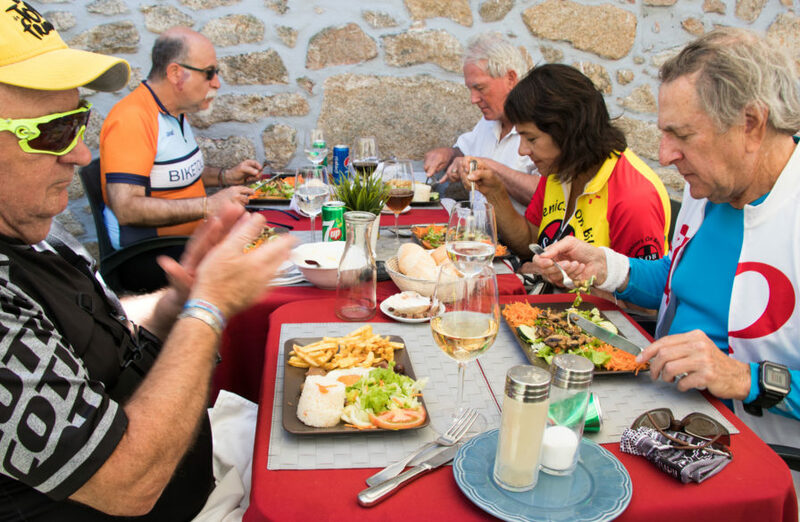 While breakfasts are included at each of the hotels you’ll be staying at throughout your bike tour, you’ll be responsible for finding your own lunch, dinner and snacks each day (so make sure you budget that in to the overall cost of your trip). 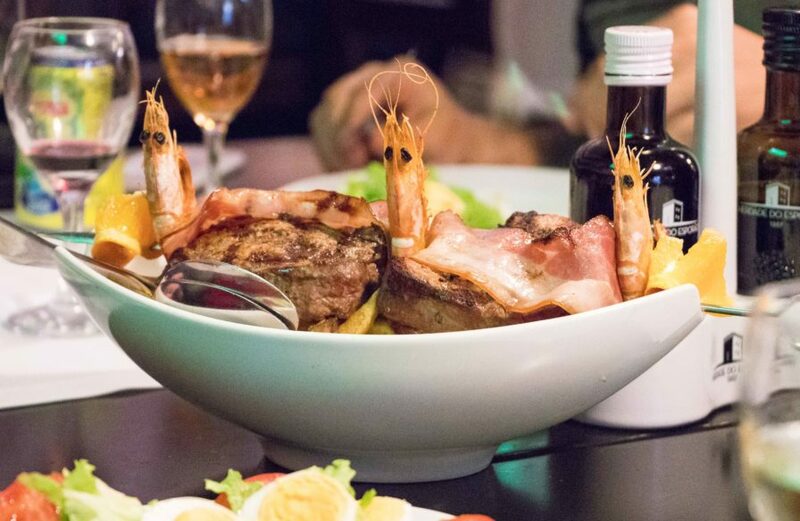 Luckily, food and drinks are relatively inexpensive in Portugal (when compared to much of western Europe), and Top Bike Tours Portugal does a good job of telling you in advance where you can find food and drinks along your route each day. You will need to pay for everything on the bike tour in Euros (EUR). Obtaining this currency is easy, as ATMs are available at multiple locations along the route. Paying with a credit card is extremely common, although having a small amount of cash on hand is a good idea – especially when paying for items in small shops and restaurants. Every hotel on the bike tour has free WiFi Internet access. Internet speeds in Portugal and Spain are good (usually 5 Mbps or higher at most of the hotels). 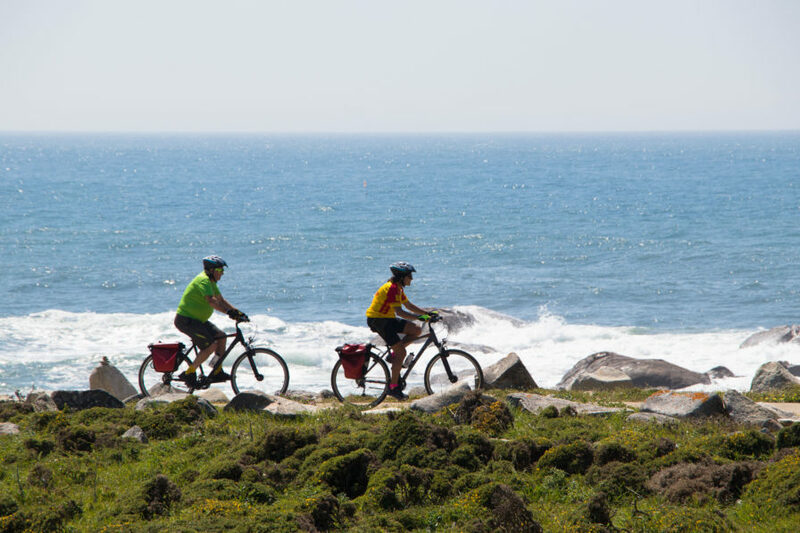 If you have any additional questions about participating in this unique bicycle touring holiday, contact Top Bike Tours Portugal directly. I found that they are quick to respond to any messages you send them and they go out of their way to help you in any way they can. 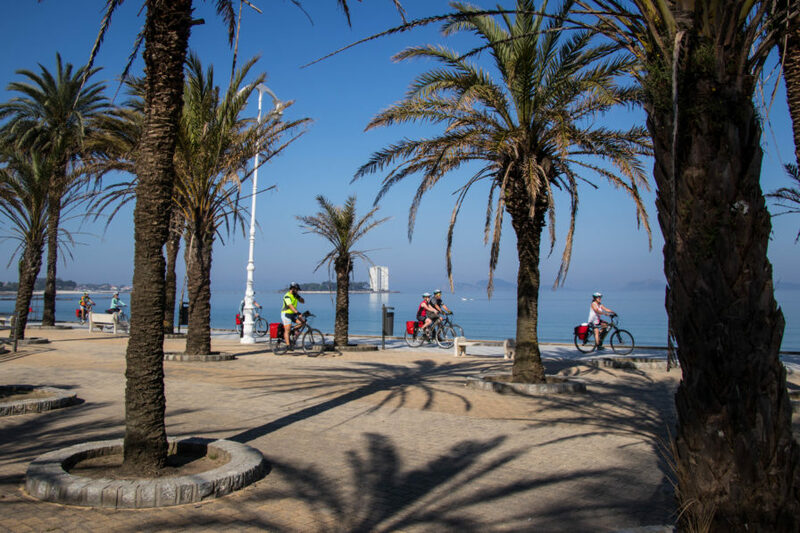 Cycling along the seashore while taking in the stunning ocean views. The support staff from Top Bike Tours Portugal (they’re some of the best, most down-to-earth tour leaders you will ever come across). 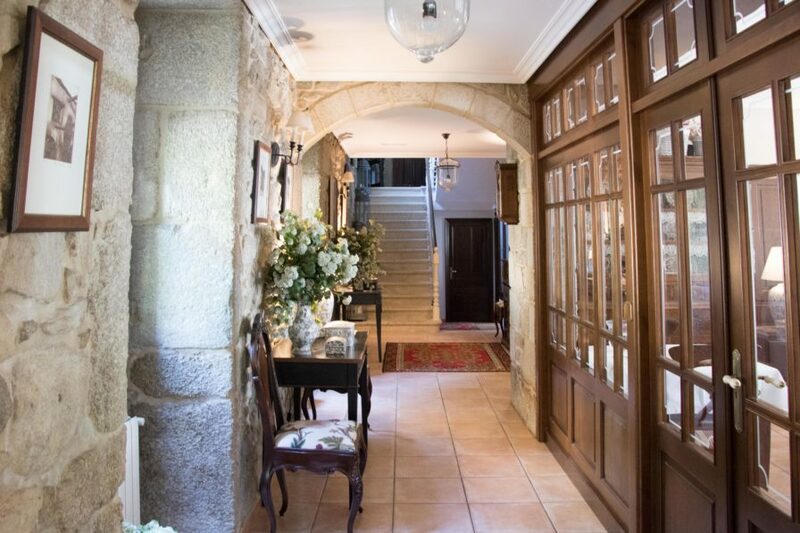 Your castle stay in Baiona, Spain. Don’t forget to walk the length of the castle walls. Exploring the Cascada del Dio Barosa (waterfall) – a relaxing paradise nestled in the trees. Biking across the ancient stone bridge in O Vao, Spain. Spending the night at the luxurious hotel Torre do Rio in Caldas de Reis and washing your feet in the city’s thermal baths. Meeting other pilgrims along the route who have come to hike the Camino from all around the world. And finally, reaching the cathedral and getting your certificate of completion in Santiago de Compostella. This entry was posted in Bicycle Touring Pro Articles, Featured Articles, Main Articles, Main Featured Articles, Portugal, Spain, Uncategorized and tagged best portugal bike tour, bike tour, camino cycling trail, Camino de Santiago, cycling, cycling holidays, cycling tours, family bike tour, guided bike tour, pilgrimage, portugal, portugal and spain bike tour, portugal bike tours, saint james, santiago de compostella, self-guided bike tour, st. james, the way of saint james, the way of st. james. Do you gps log anywhere? Mapmyride, Garmin, Strava, etc.? I sure would love to see the actual path you follow on your rides. BTW after doing lots of prep I did a solo crossing of the US this summer from June 1 to July 10. It came out to 3,300 miles from Oceanside, CA to Myrtle Beach, SC. Family and friends did support on a hybrid route that followed the RAAM race course to just past Wichita, KS and then switched onto the TransAm to Damascus, VA. From their I free lanced it to my home in Winston-Salem and after a some rest onto Myrtle Beach, SC. Thanks for the inspiration and tips. As an avid cyclist at 52 it was a bucket list dream come true. I would like more information on The Way of St. James Bike Tour with Fold N’Visit Cycling Holidays. For example, is the tour taking place September 15-21? How much does it cost? Are there ebikes available? Thanks. Please contact the Fold n Visit company https://www.topbiketoursportugal.com with the email: info@topbiketoursportugal.com.